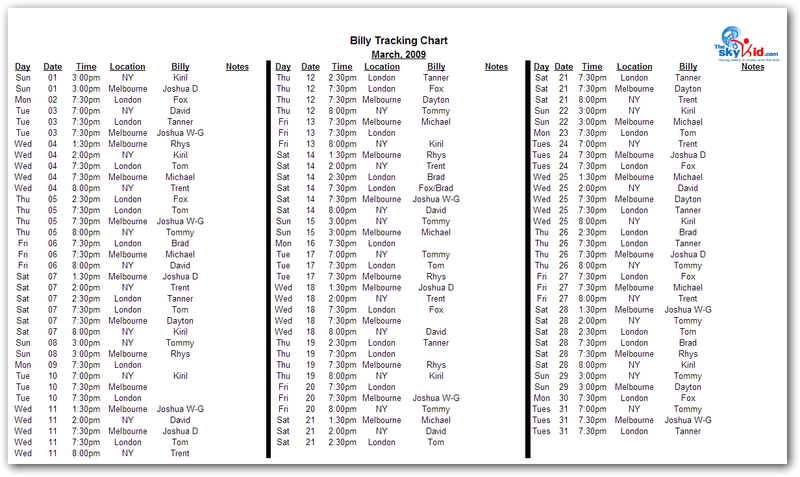 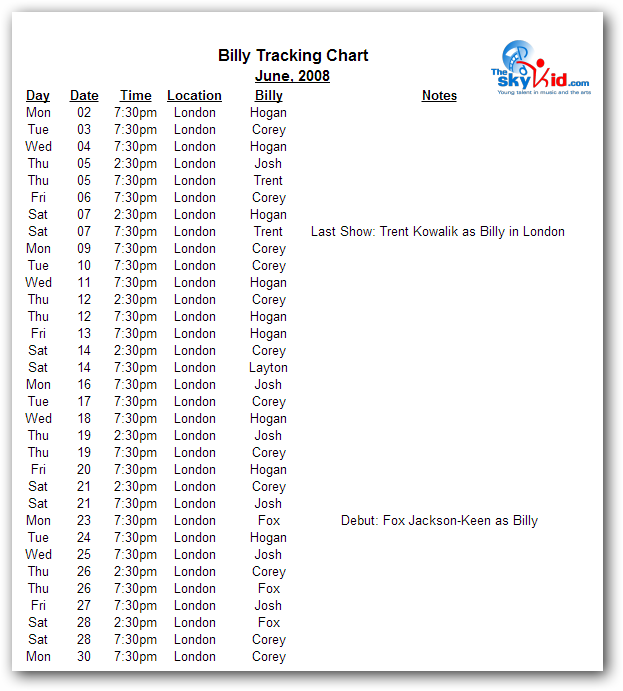 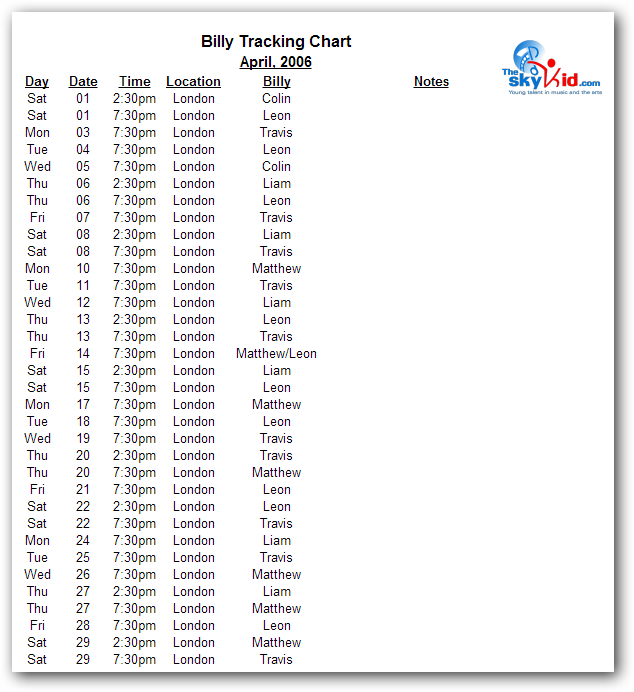 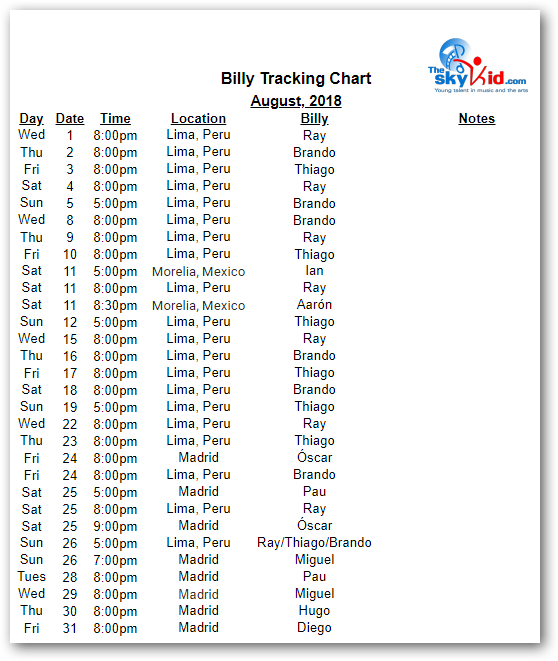 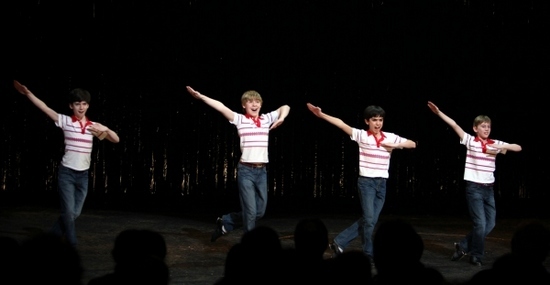 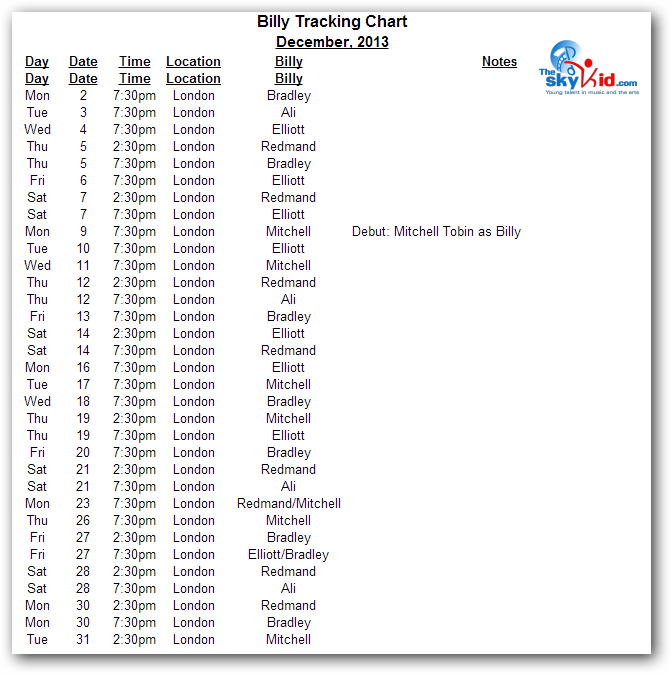 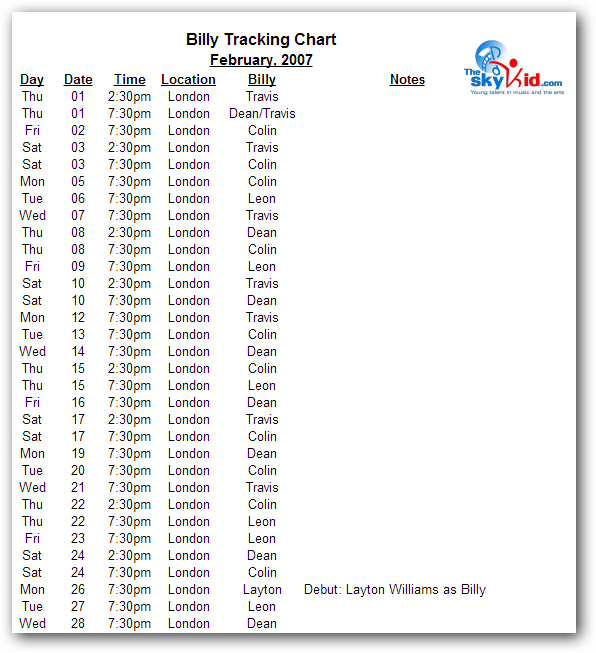 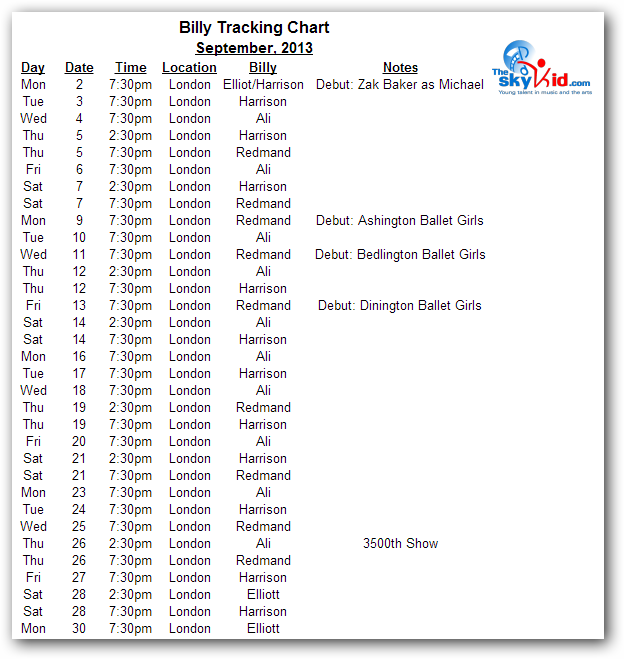 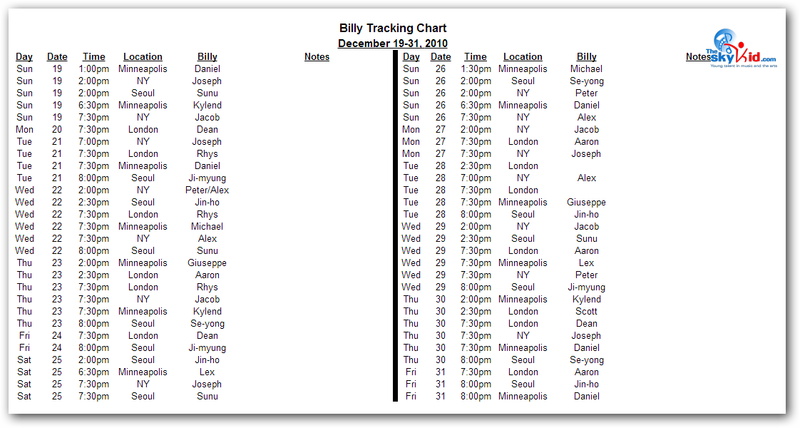 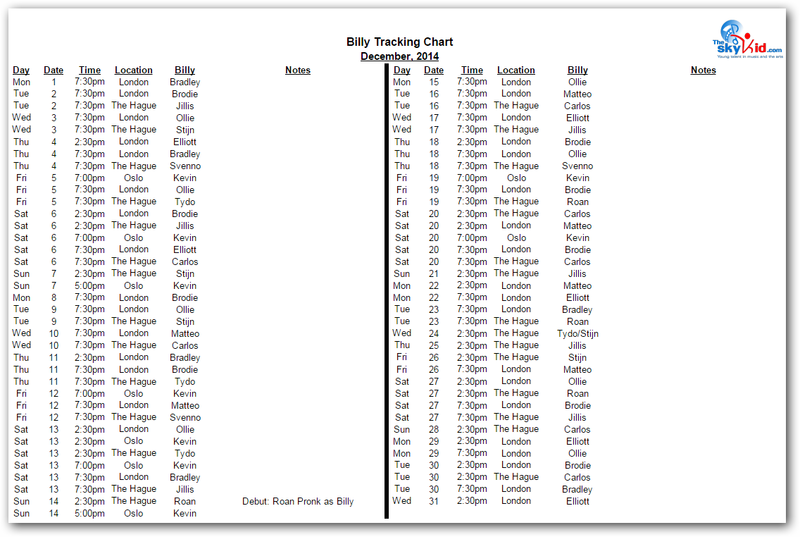 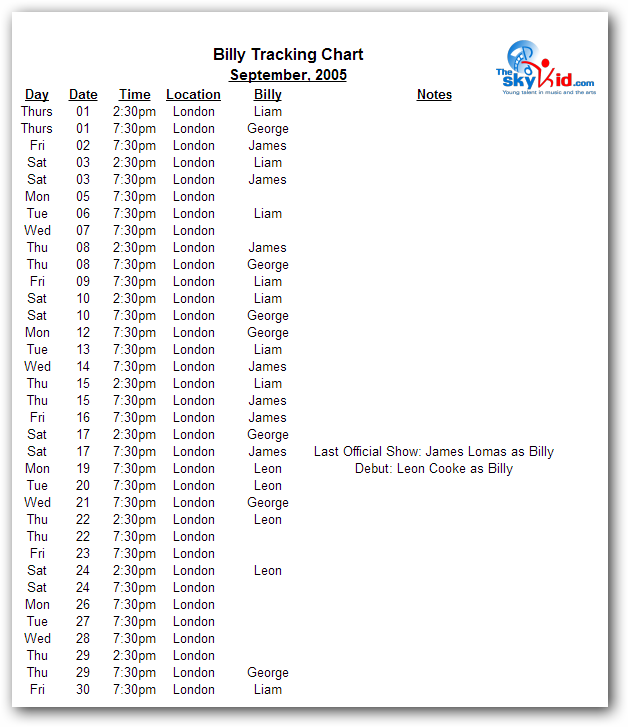 Like some of the other data associated with Billy Elliot the Musical, the tracking of which boy has portrayed Billy at any given performance is information in danger of being lost forever if it’s not recorded properly. 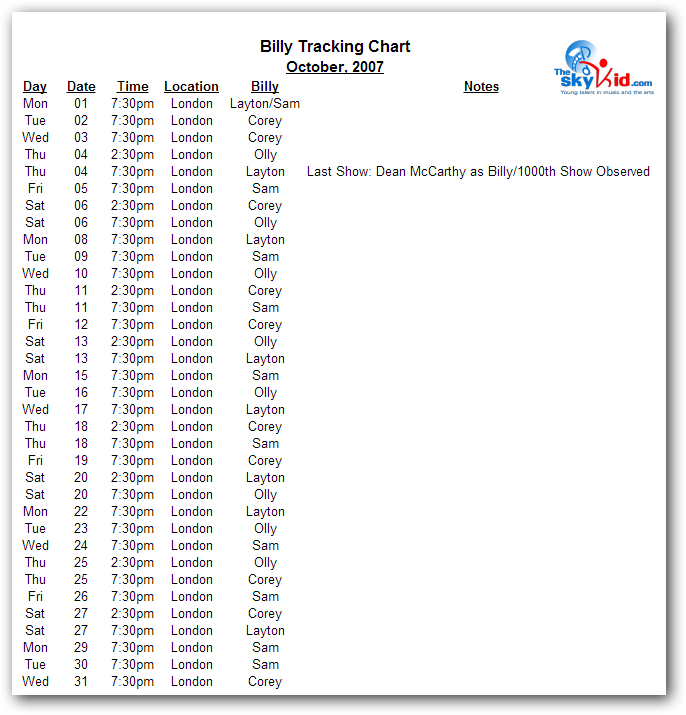 So again, here at theskykid.com, we are endeavoring to create a historical record of that information so it’s always available to posterity. 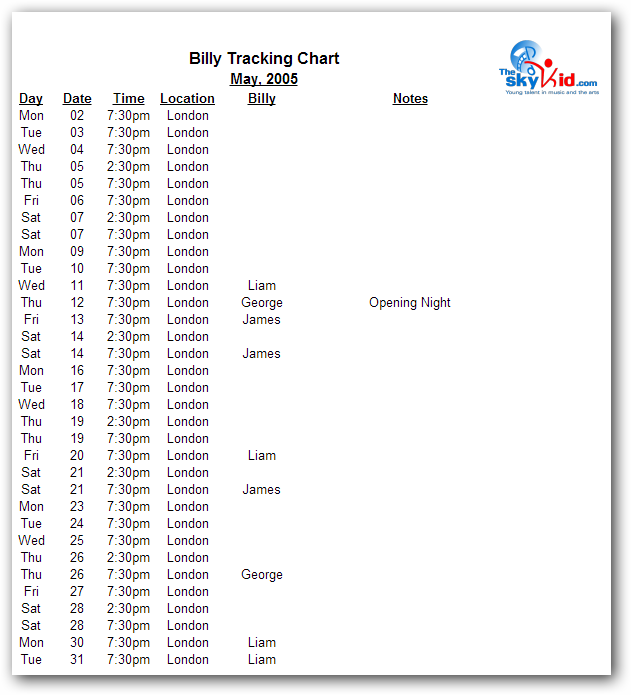 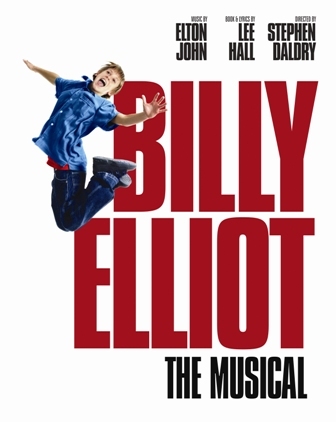 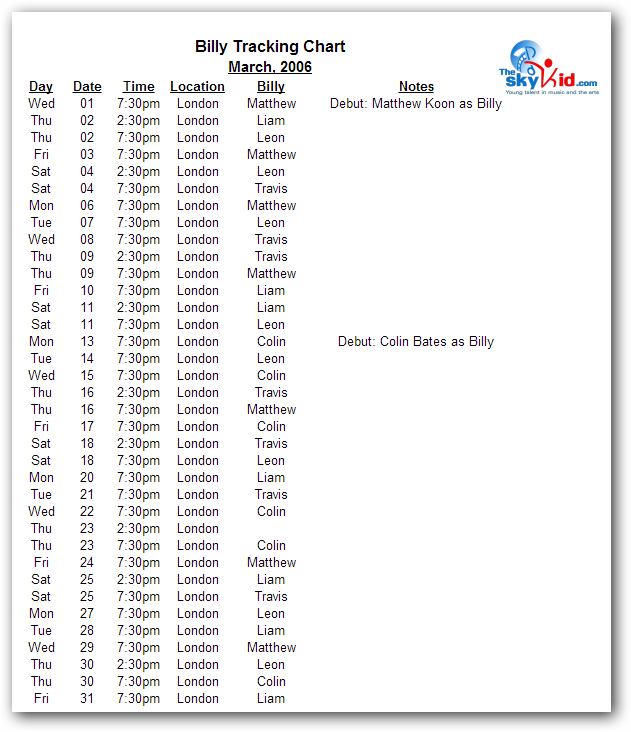 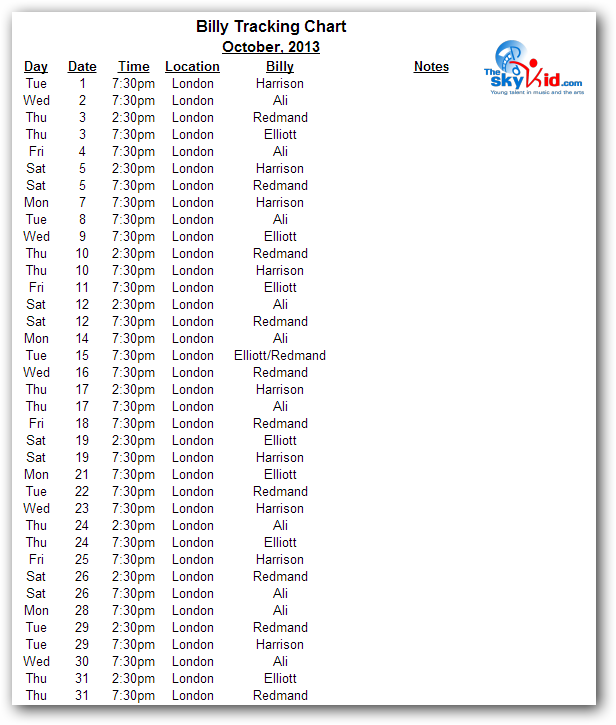 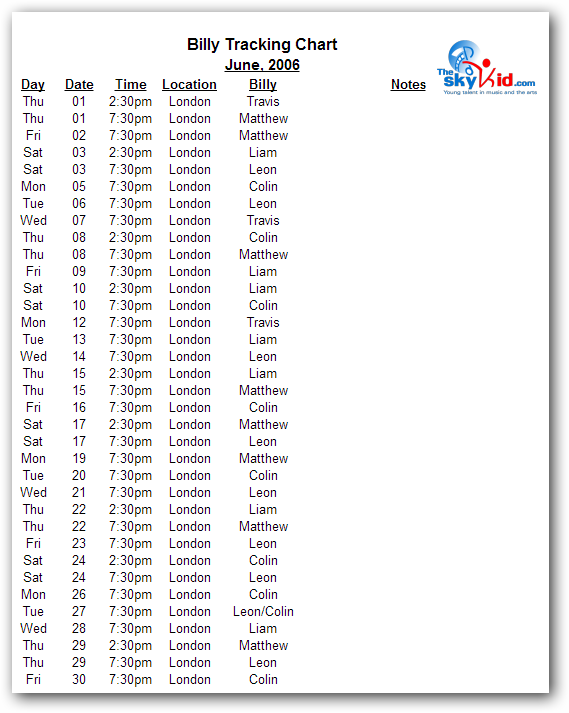 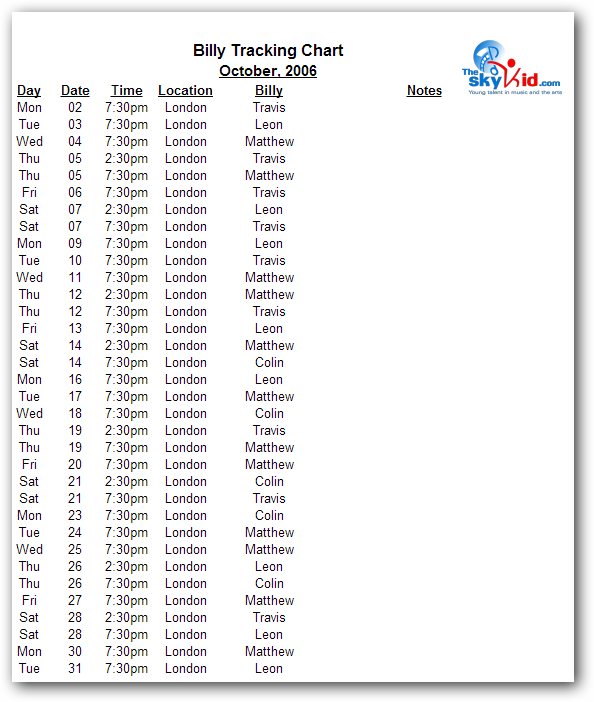 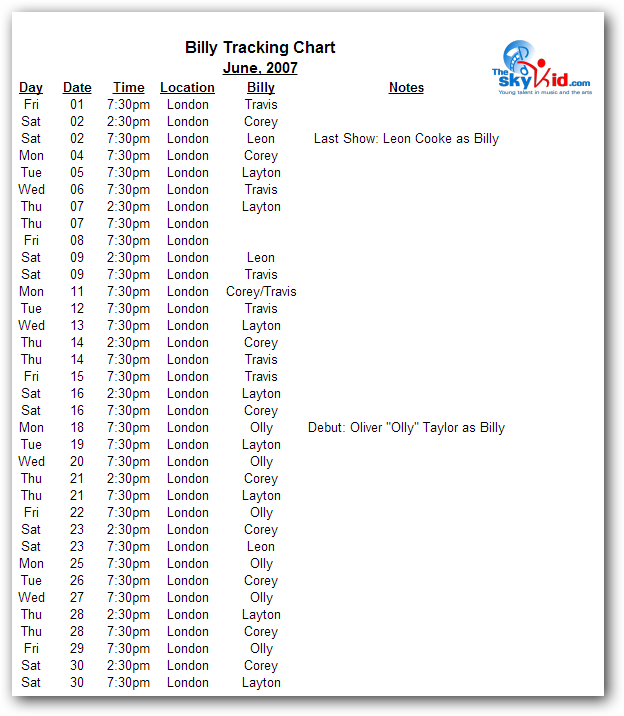 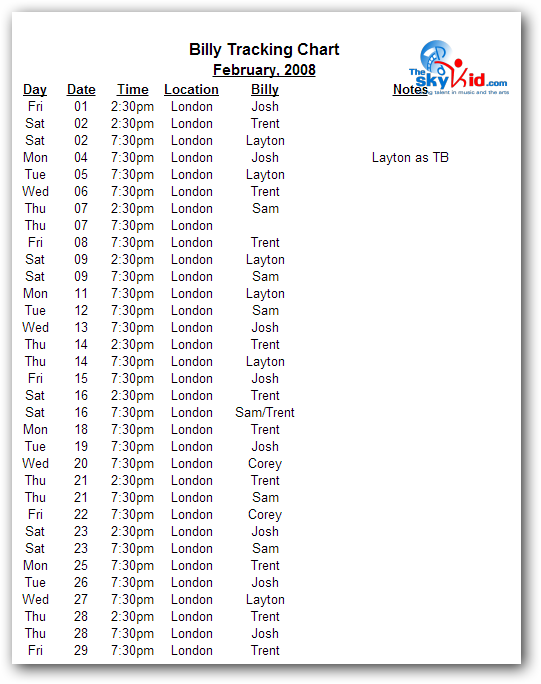 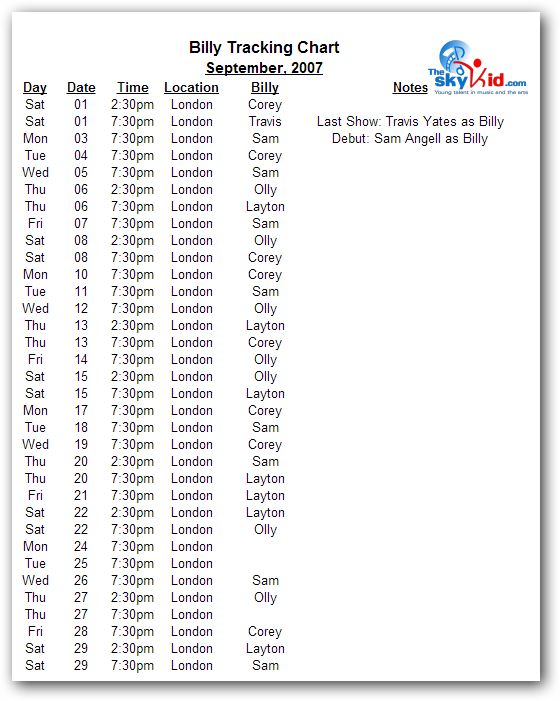 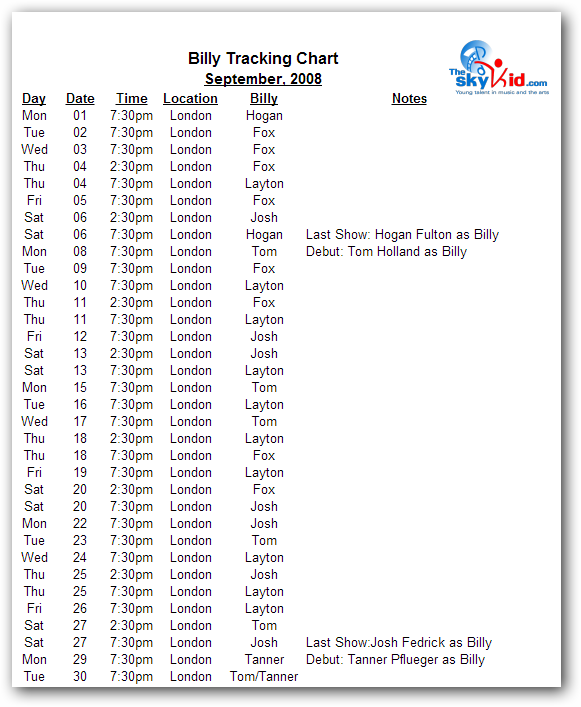 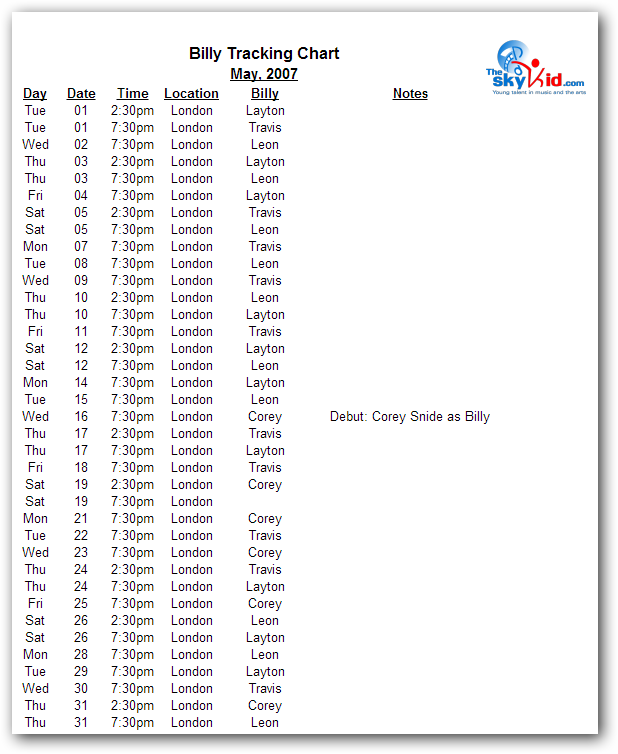 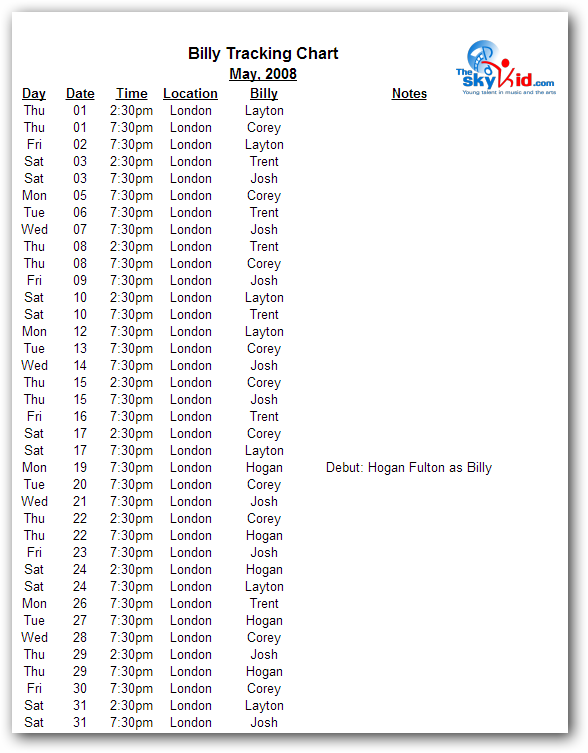 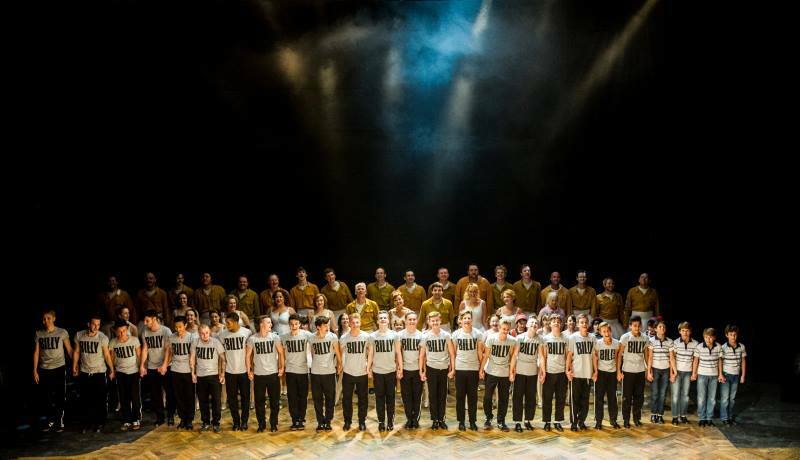 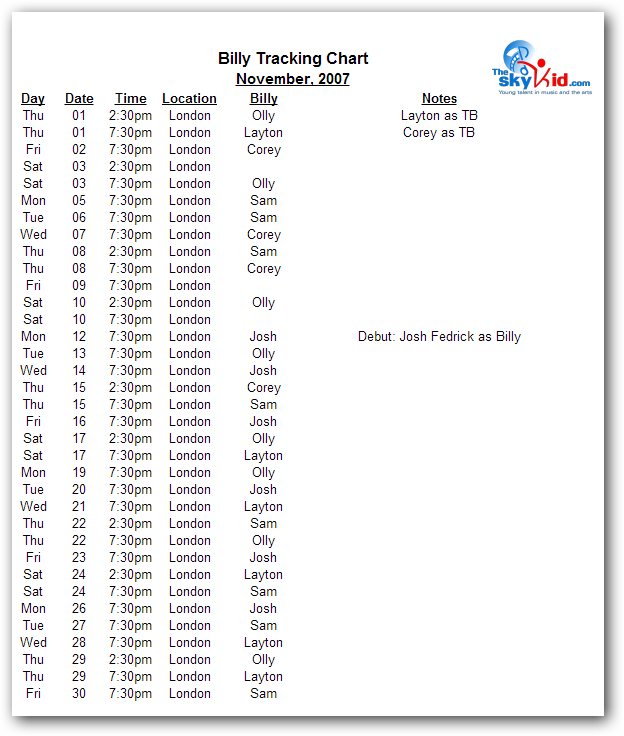 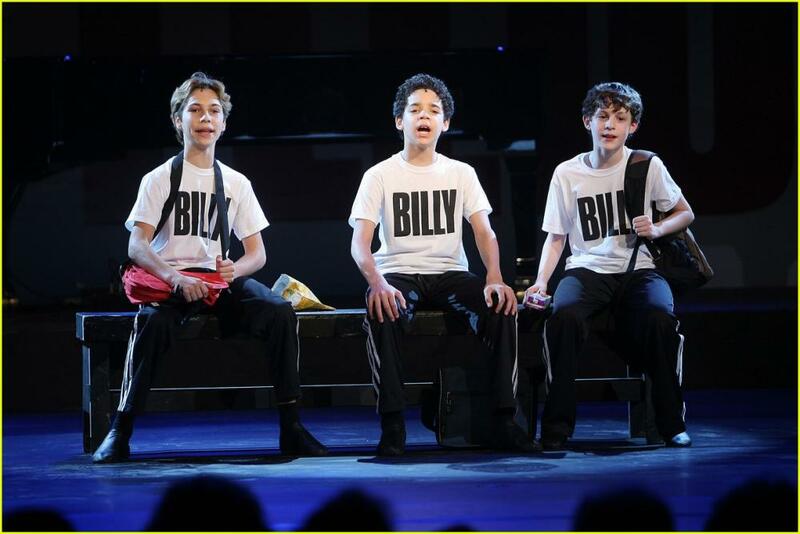 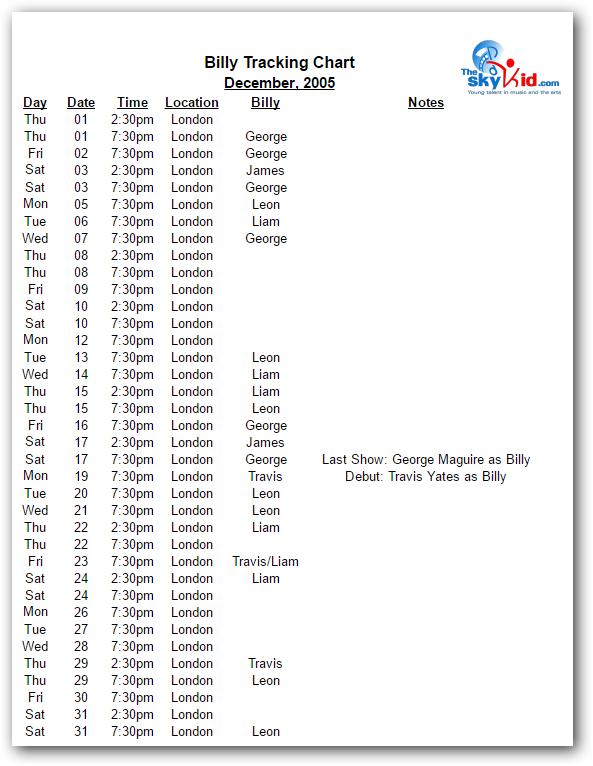 Beginning on March 31, 2005, with the first preview performance of Billy Elliot the Musical in London, this article provides a listing of the actors who portrayed Billy for each performance — for all active productions of the musical, by performance date. 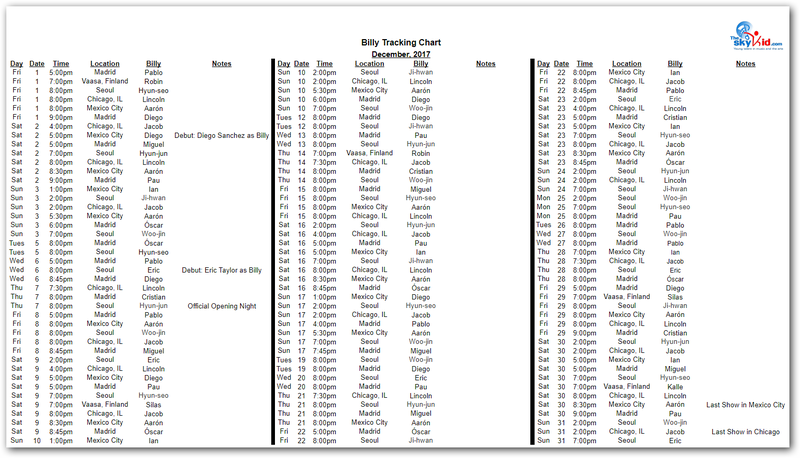 The charts are formatted by month. 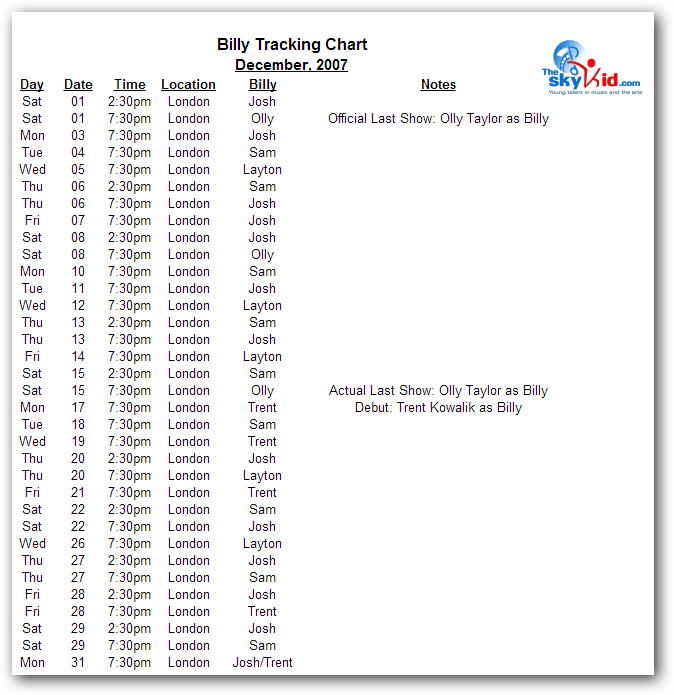 London data prior to January, 2012 is not complete. 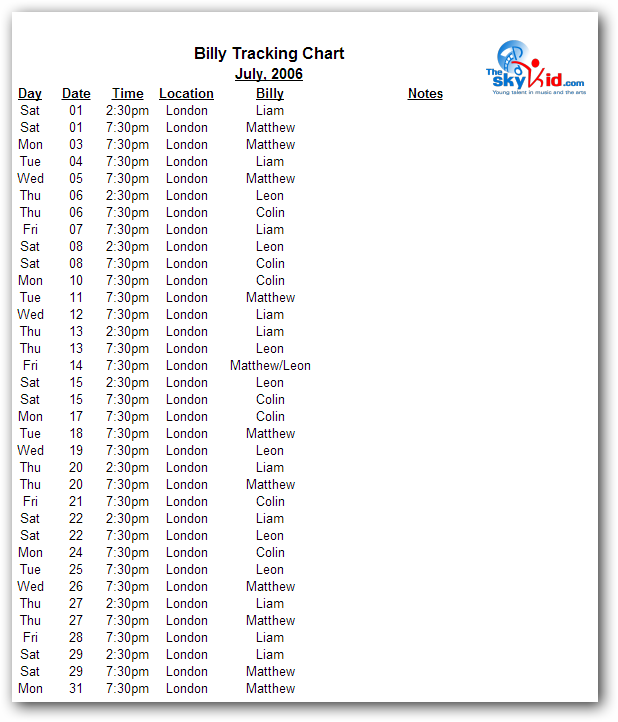 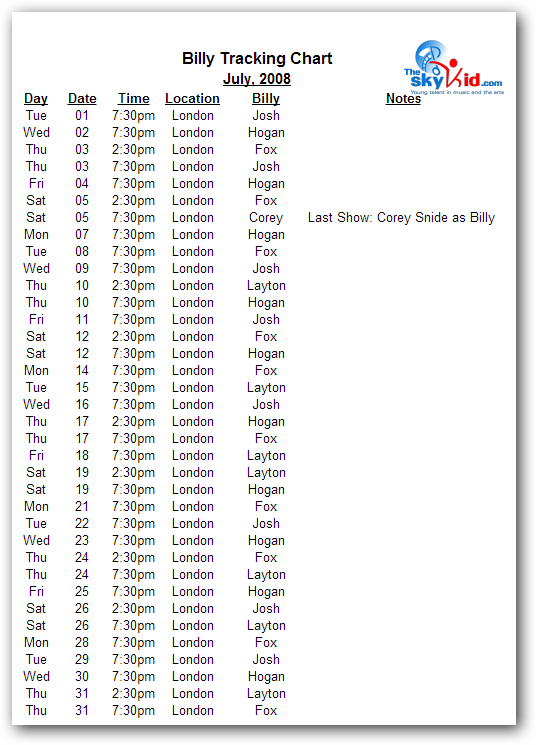 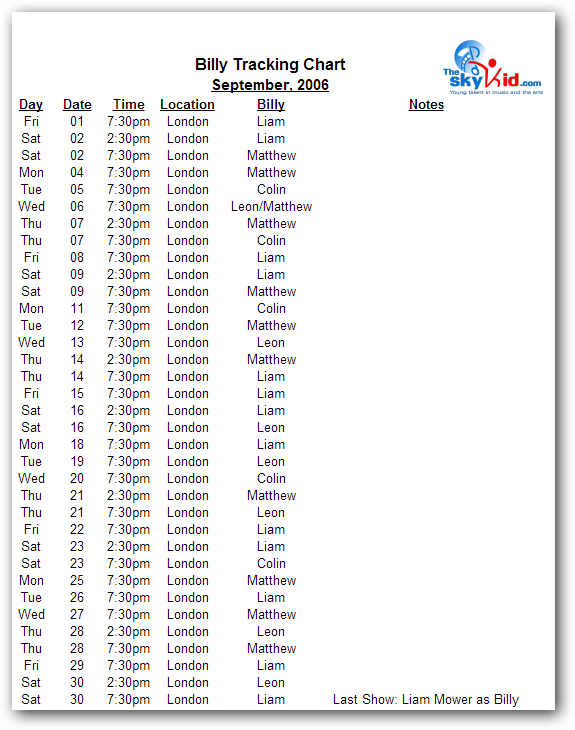 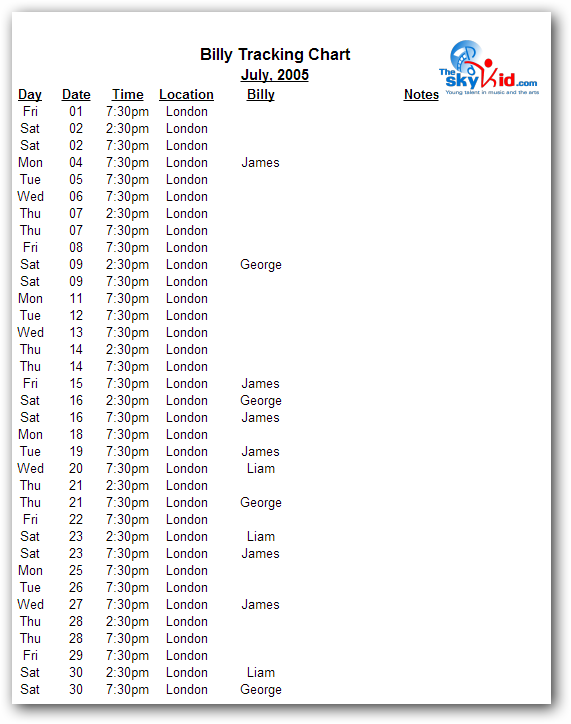 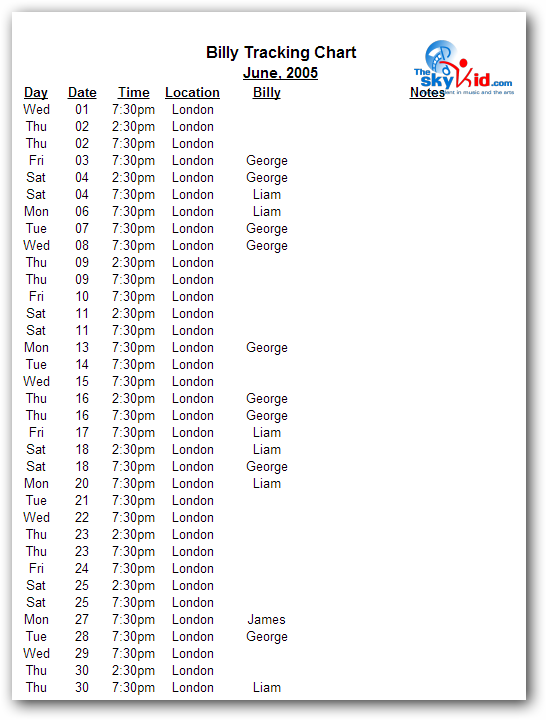 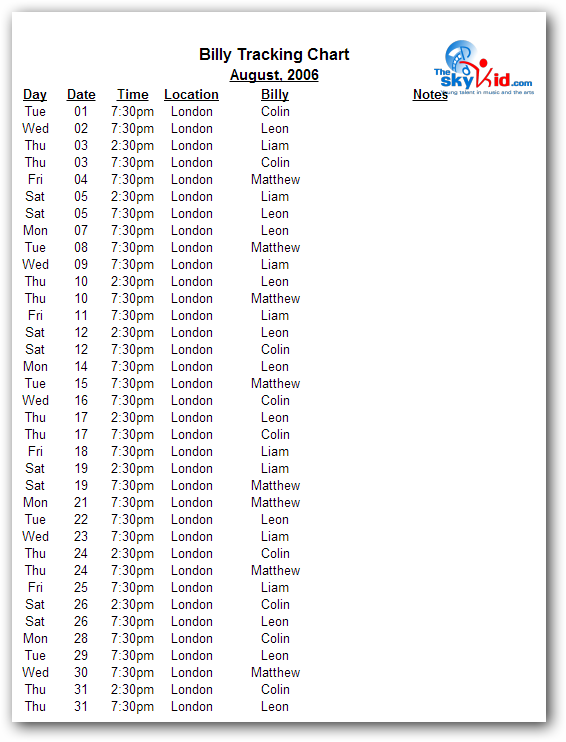 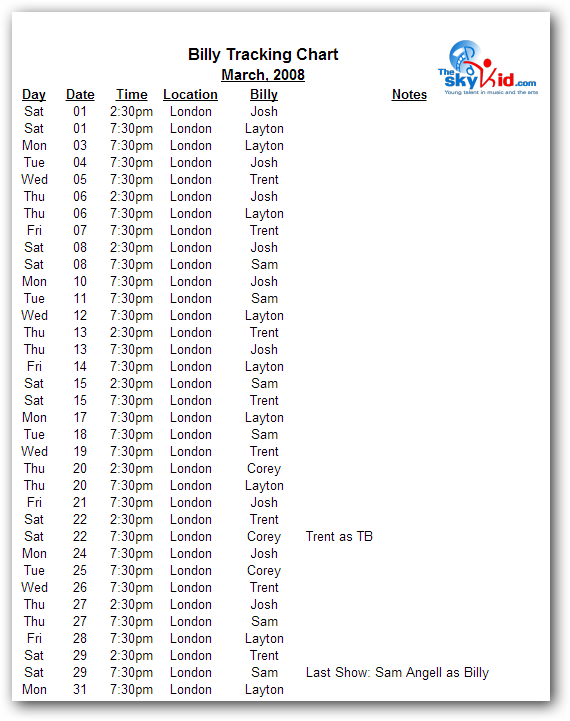 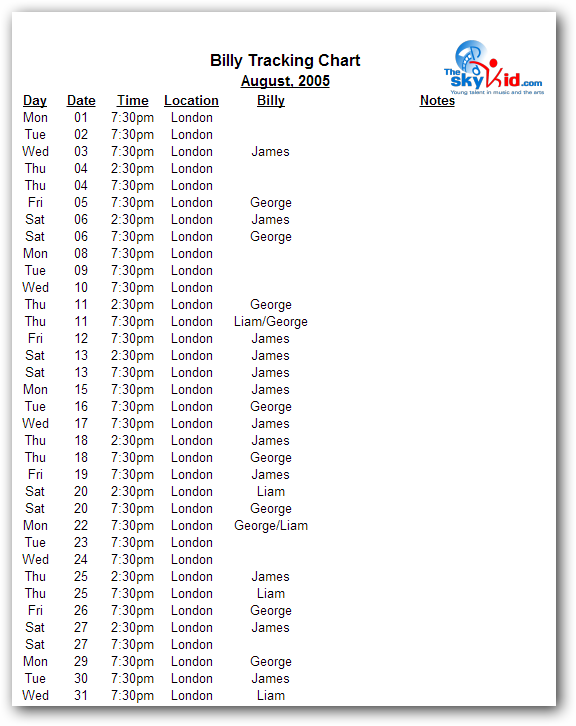 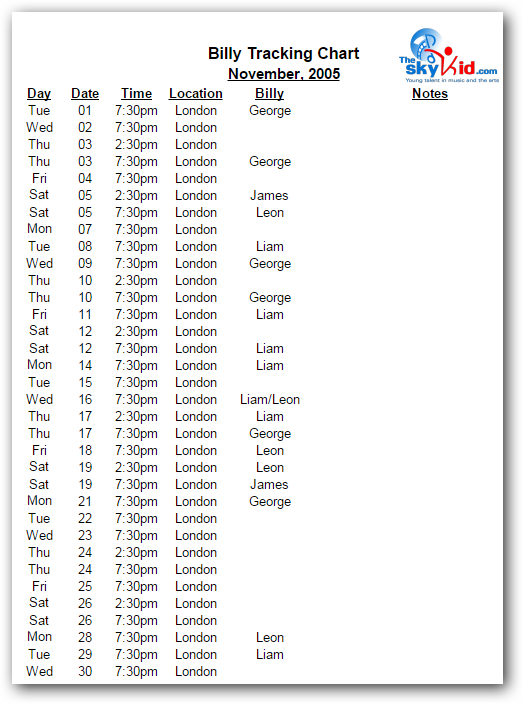 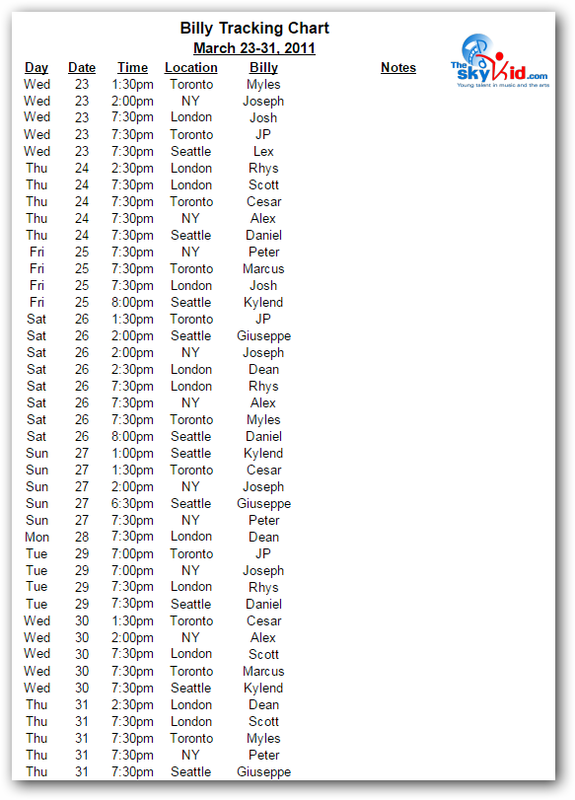 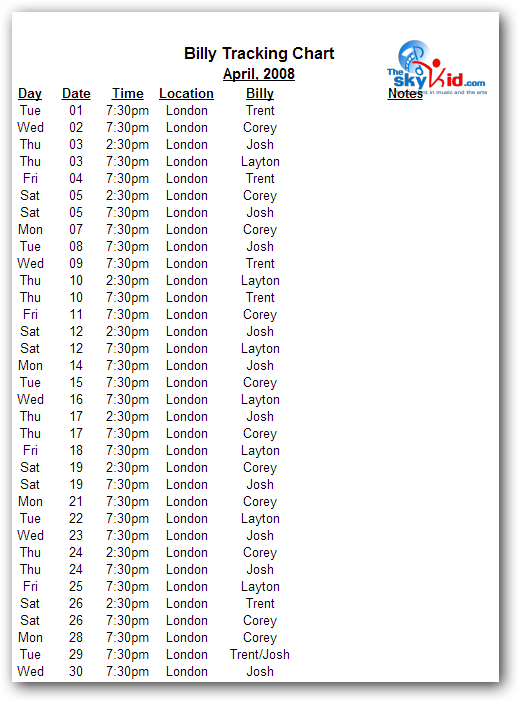 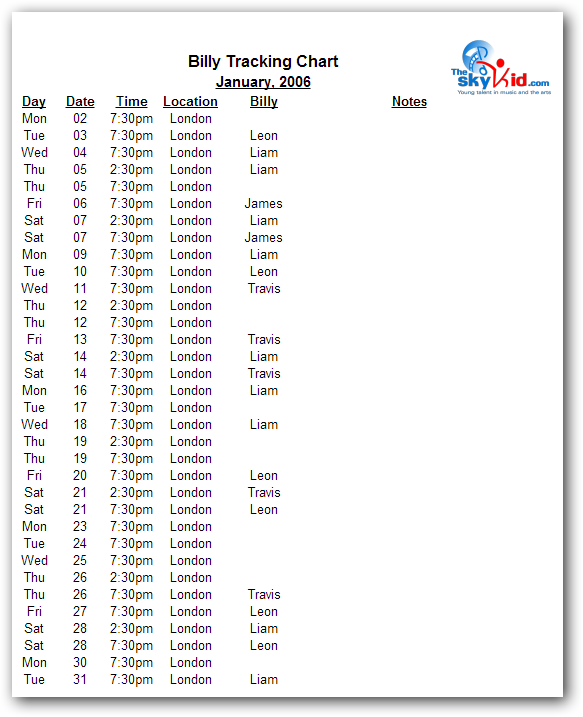 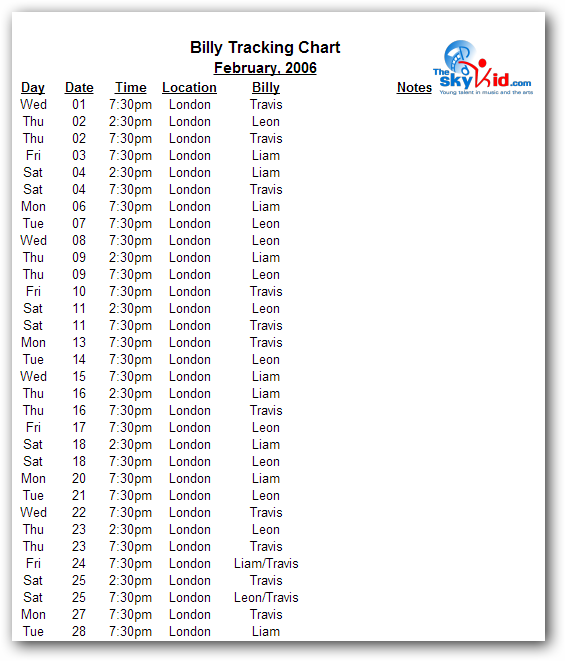 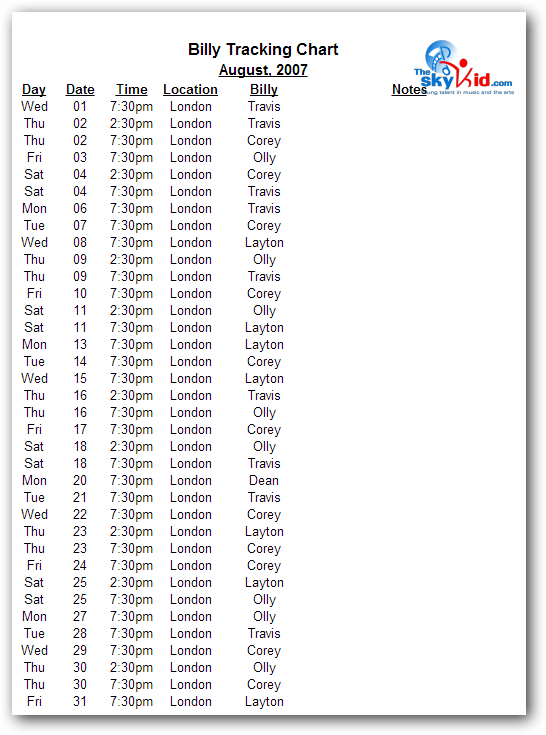 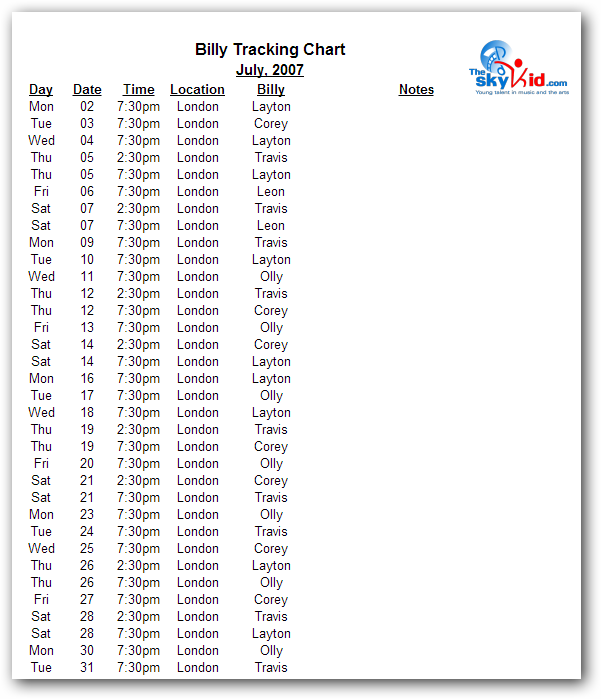 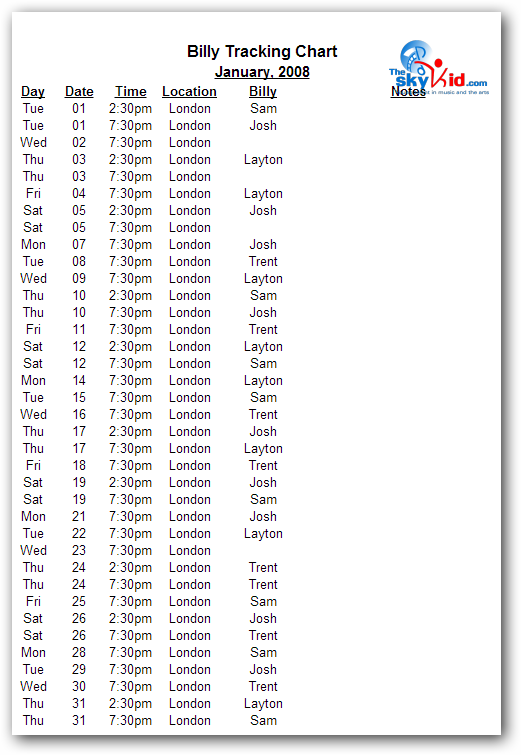 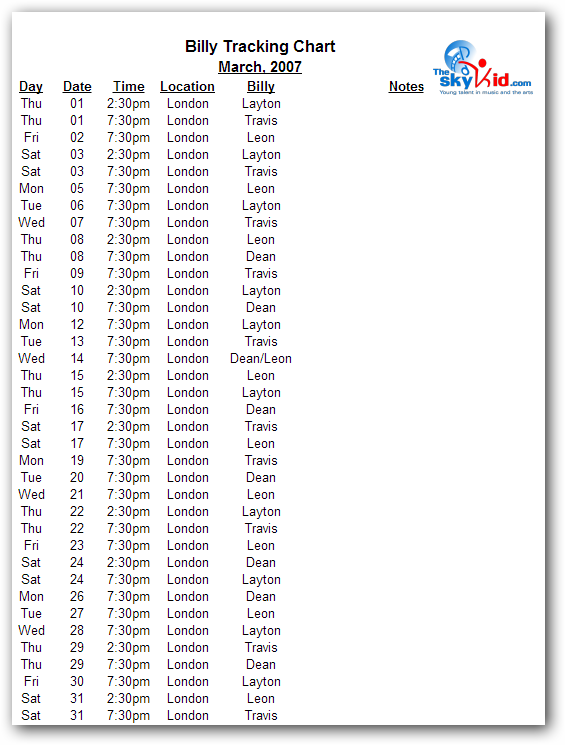 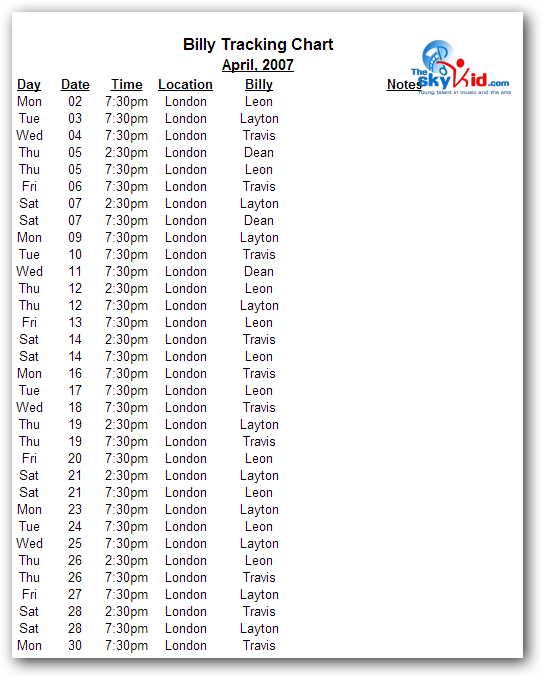 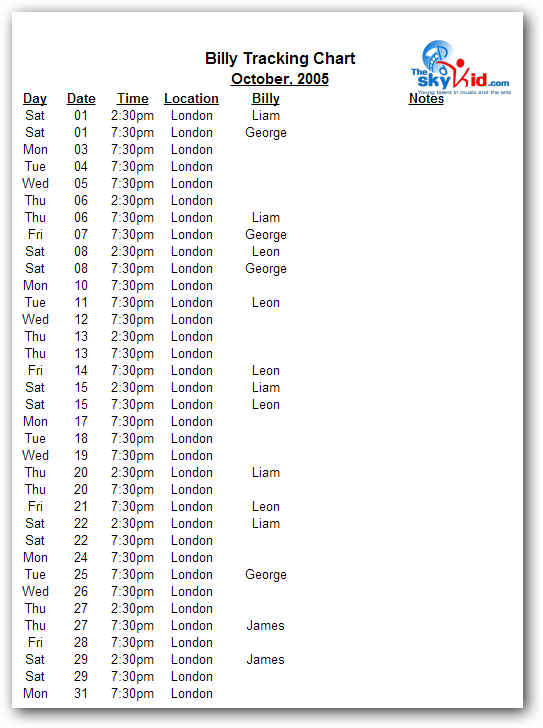 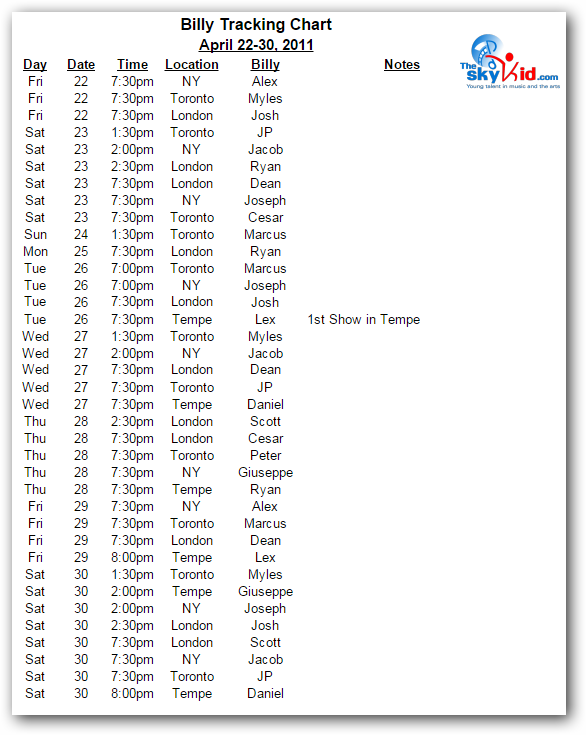 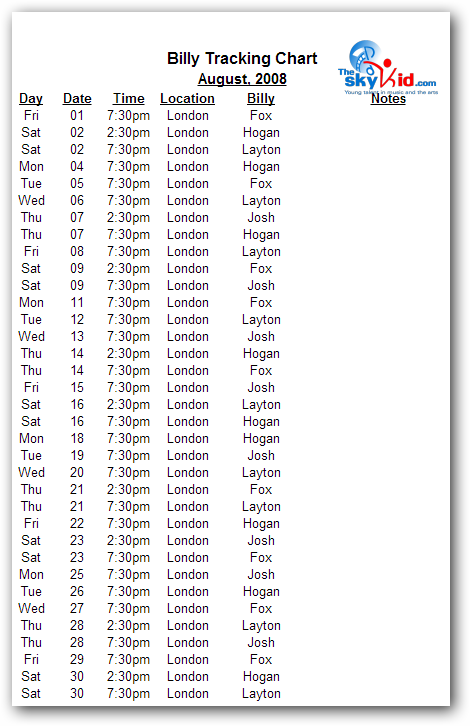 On the charts, the reader will note blank spaces next to some London performance dates, especially in 2005 and 2009. 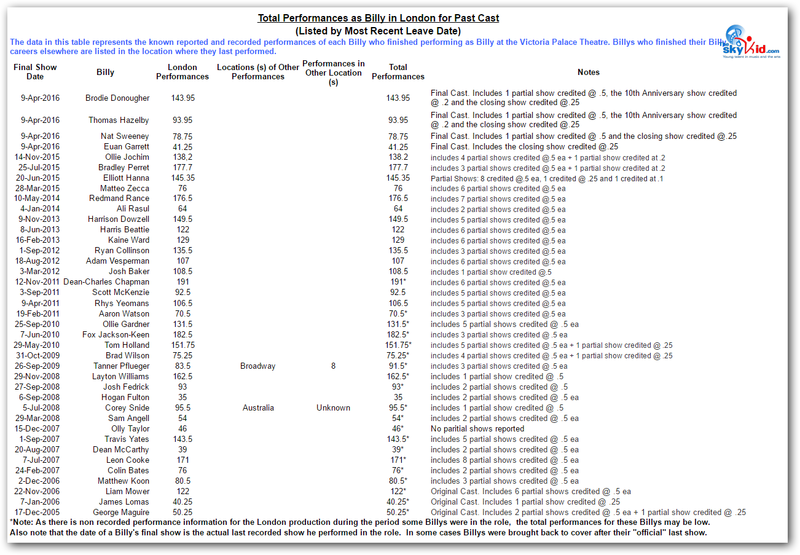 From the beginning, the data for the West End production has been supplied solely by fans of the show who have been in attendance at a performance and have graciously taken the time to note who had performed at the show they’d just seen. 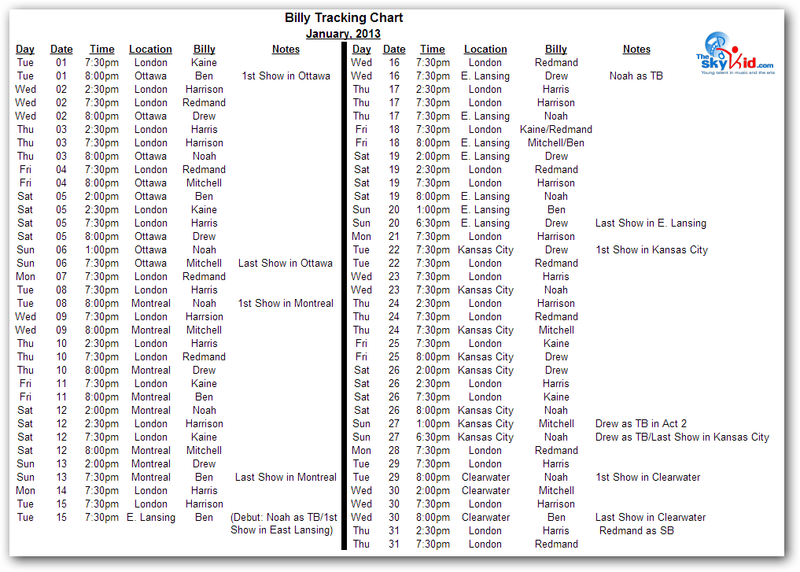 Obviously, that can be a “hit or miss” approach, as there are some shows fans didn’t attend or, if they did attend, they didn’t report who performed. 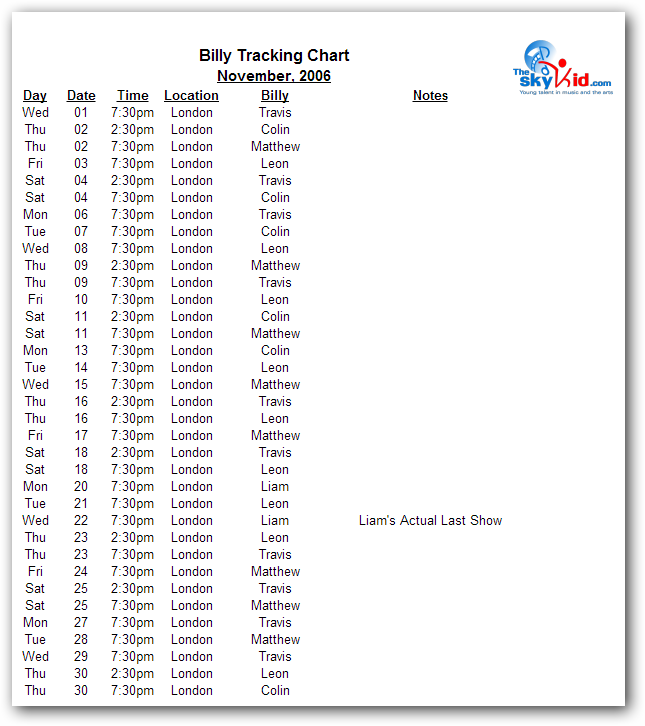 Readers will note that, beginning with the summer of 2012, London data (and indeed data from all the productions) is pretty much complete due to the diligence of fans who have faithfully supplied the information of which Billy performed at each venue. 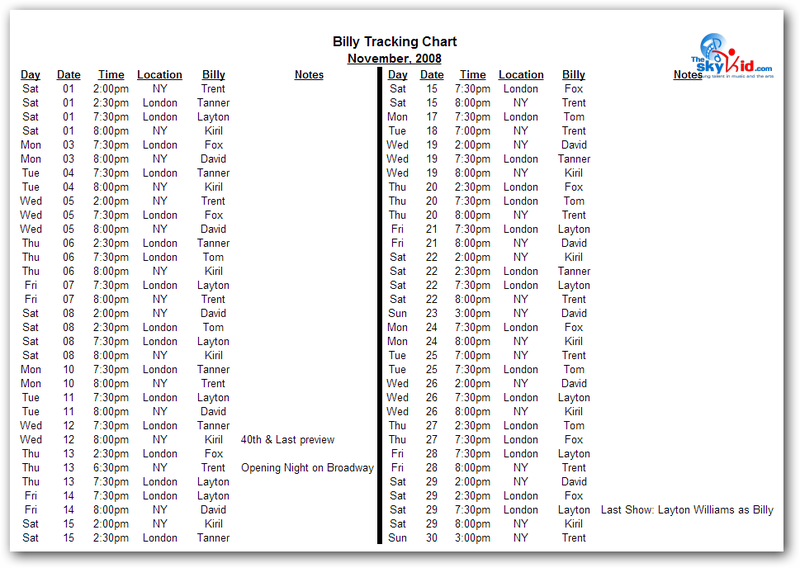 Note: Each of the tabs, below, represents one year of shows. 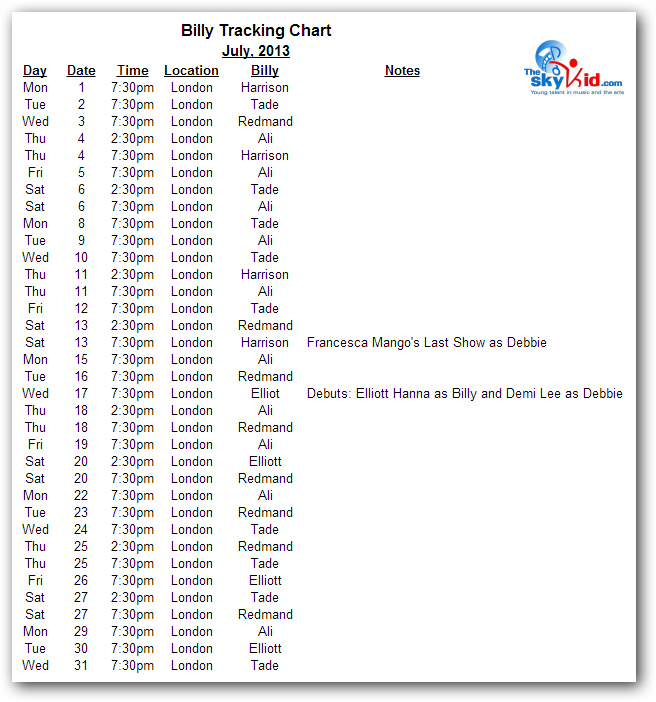 The charts encompass combined data from all productions of BETM that were running in each month. 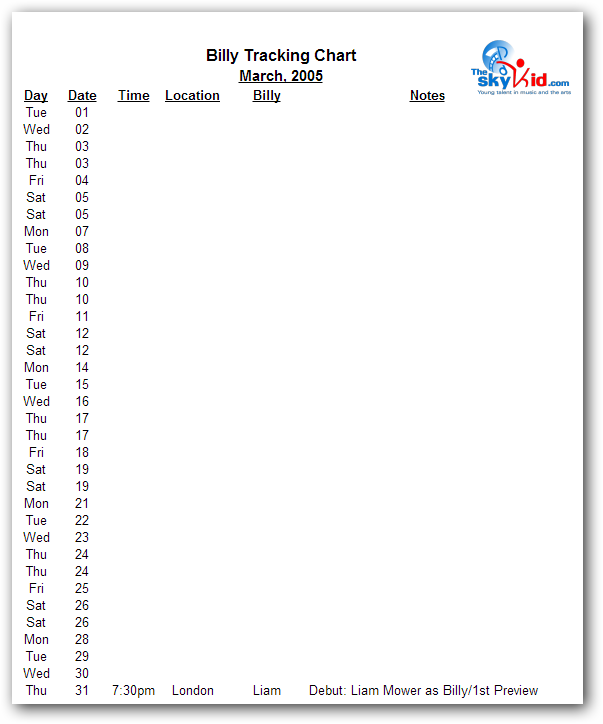 To access the information, click first on the appropriate year’s tab and then on the thumbnail of the month you desire. 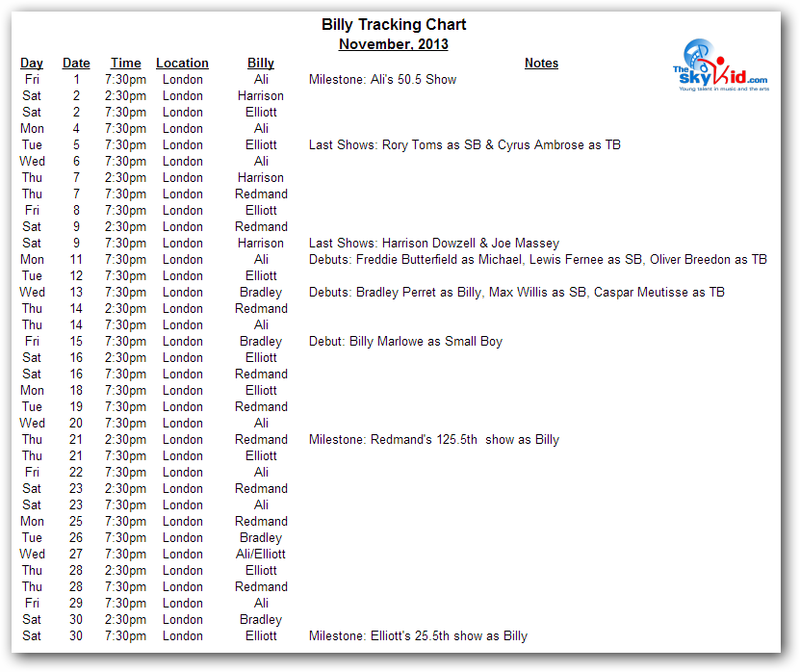 Note: The Billys are listed on the charts by first name only. 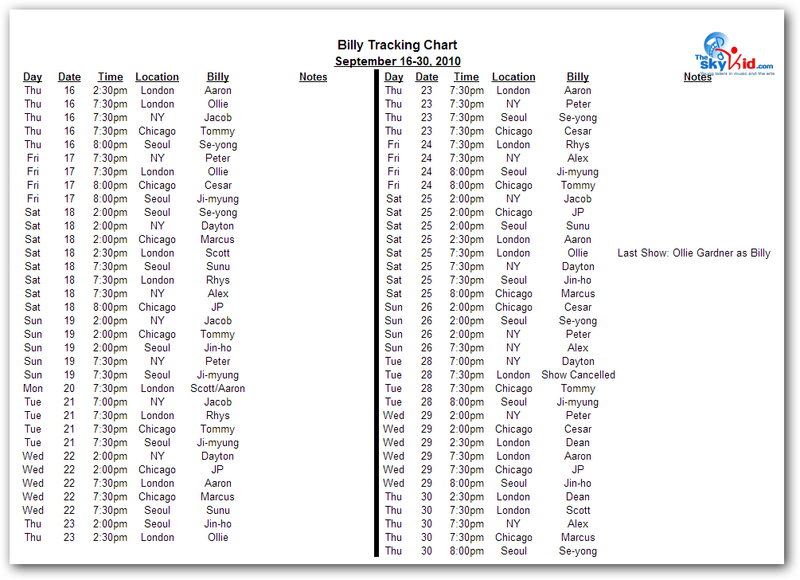 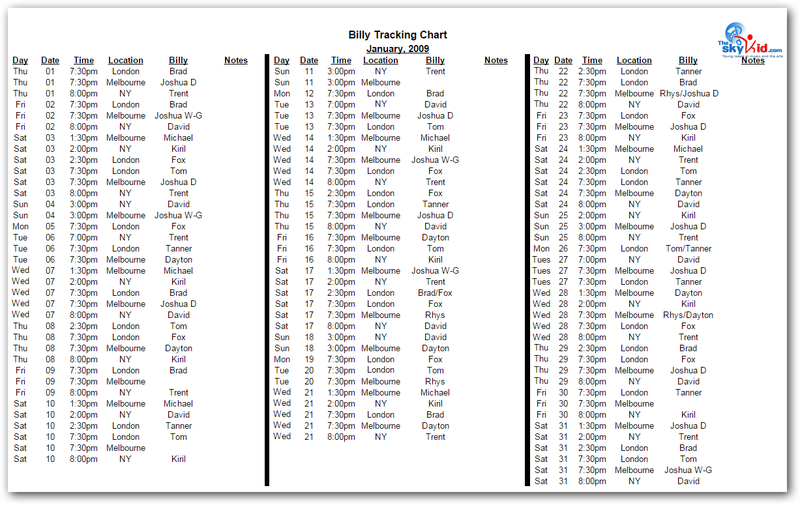 A complete list of the Billys is located here. 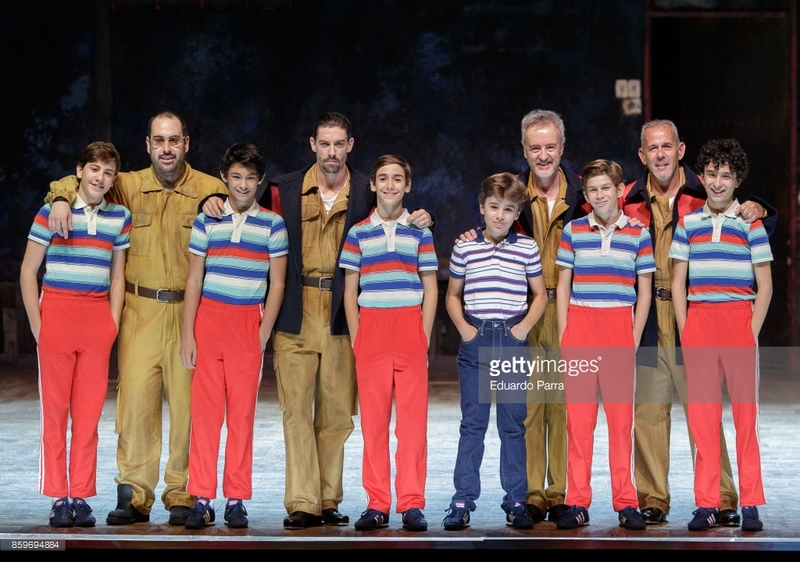 The Billys and Michaels from Tampere, Finland with the production’s director, Samuel Harjanne (back). 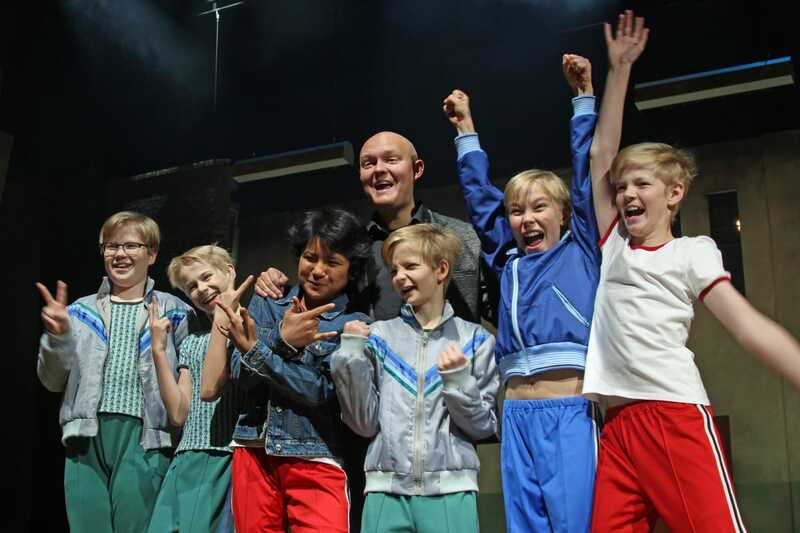 Front l-r: Nuutti Kerppilä (Michael), Juho Mönkkönen (Michael then Billy), Jiri Rajala (Billy), Ilmari Kujansuu (Michael), Simo Riihelä (Billy), Osku Perkiö (Billy). 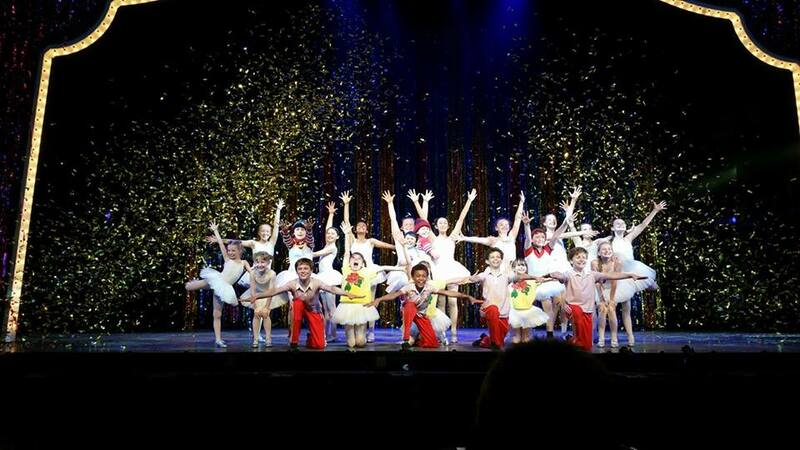 Among other happenings in the BETM world, 2016 is the year that the original production of the show came to an end. 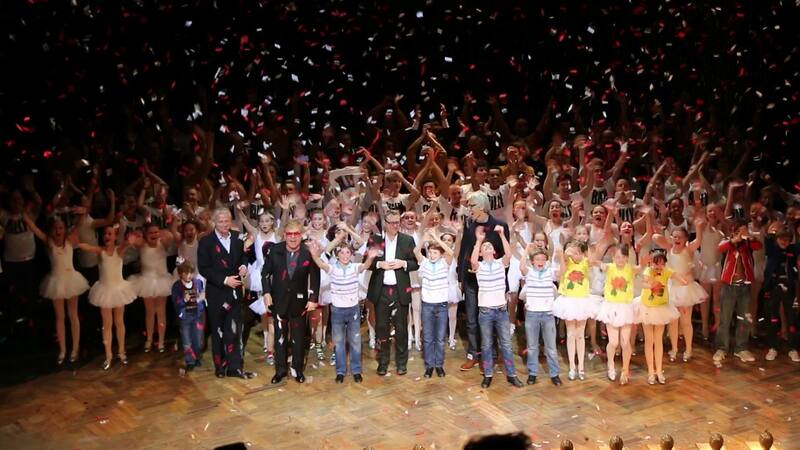 April 9th was the final show at the Victoria Palace Theatre in London. 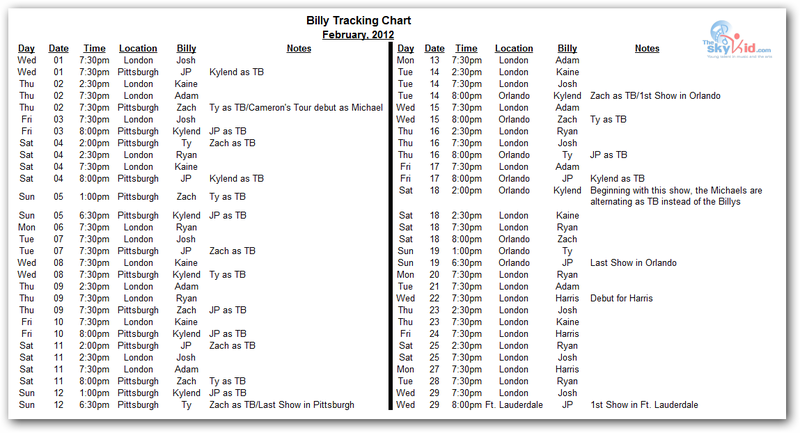 February also marked the beginning of the first ever UK/Ireland Tour production in Plymouth, England. 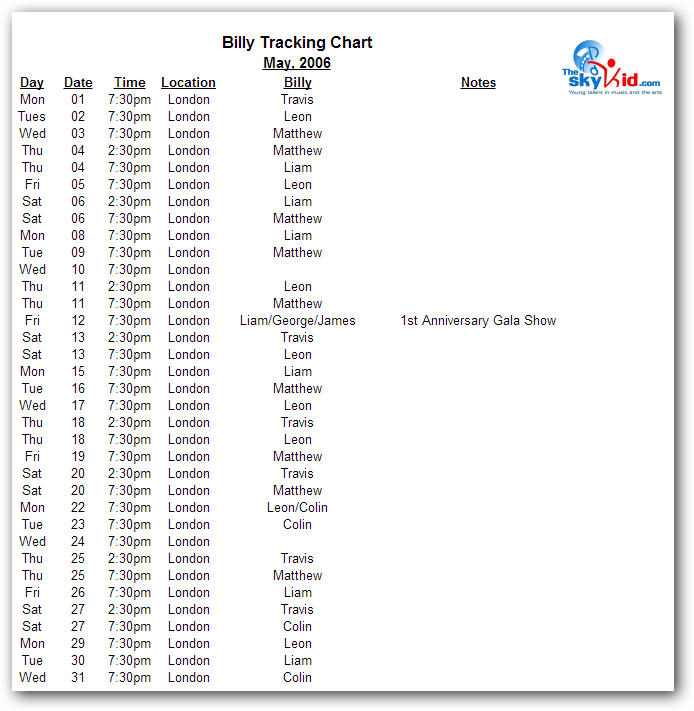 The Tour was initially booked into 10 venues around the UK and in Dublin, Ireland. 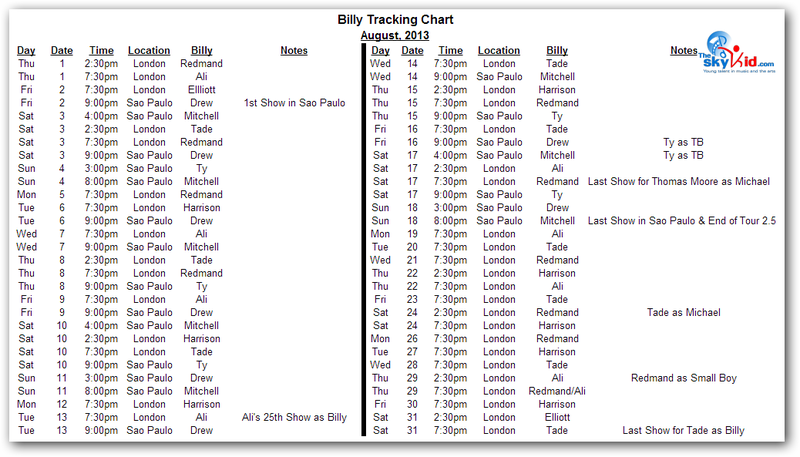 The Tour Billys’ performances are being recorded here also. 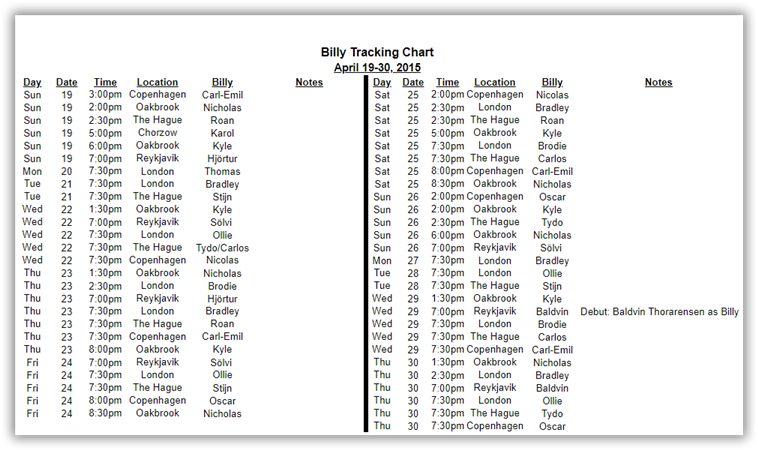 After almost exactly one year and 323 performances, Billy in The Netherlands closed on 7-Nov-2015. 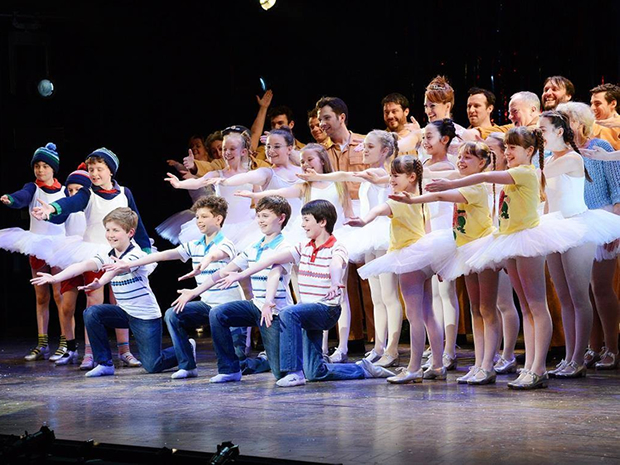 All 12 Billys who had starred in the show there performed in a special mashup at the end of the final show. 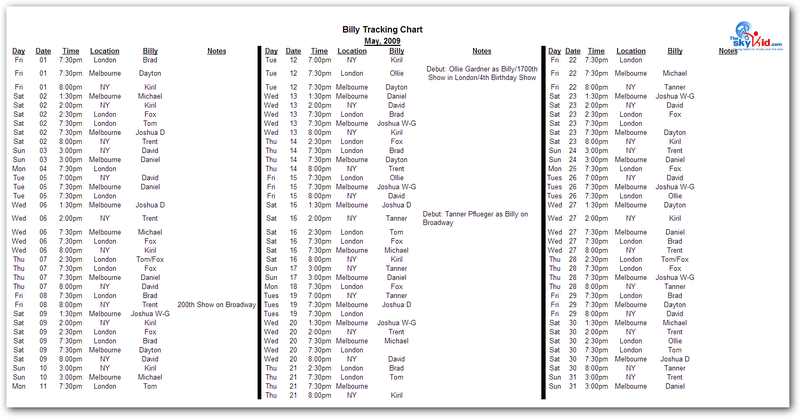 Opening night in Sydney, Australia. 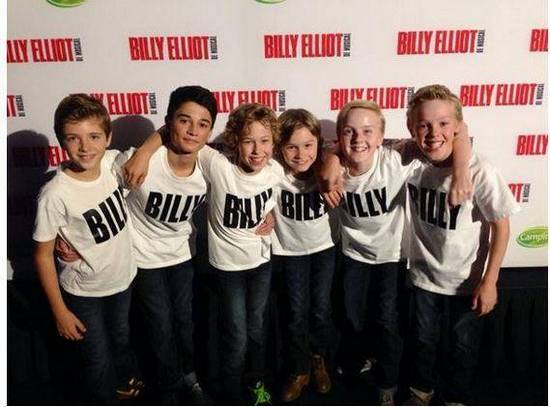 Left to right Rhys Kosakowski, Nick Twiney, Elton John, Lochlan Denholm, Rarmian Newton, David Furnish. 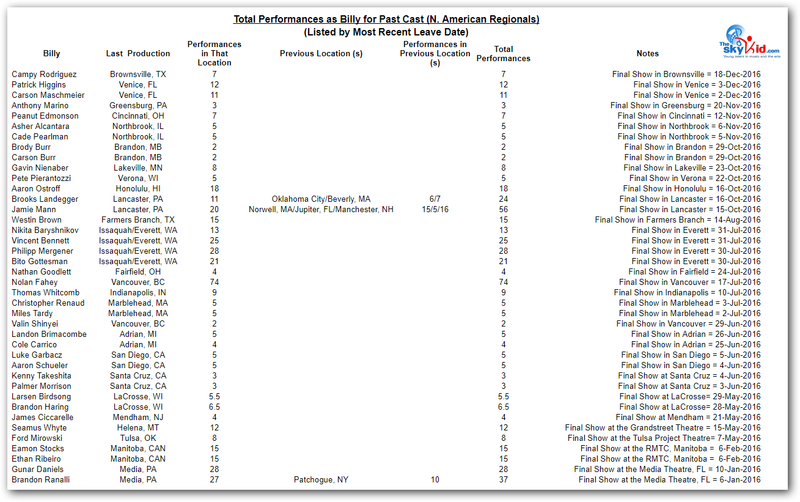 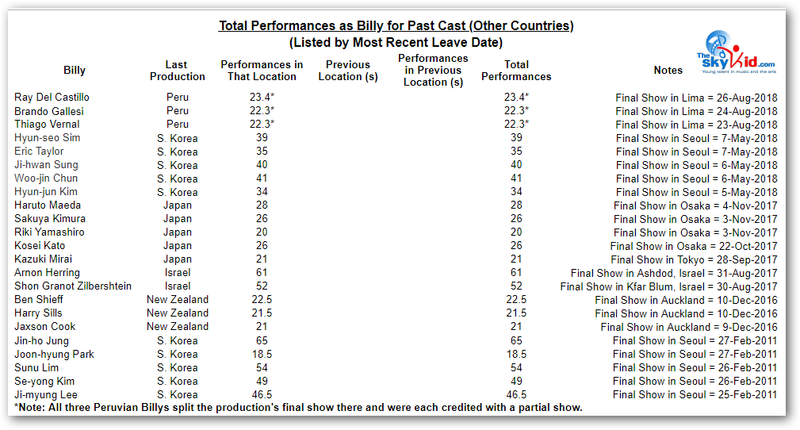 Cumulative totals for Billys who appeared in past productions of the show, sorted by productions in the area of the world where those productions were presented. 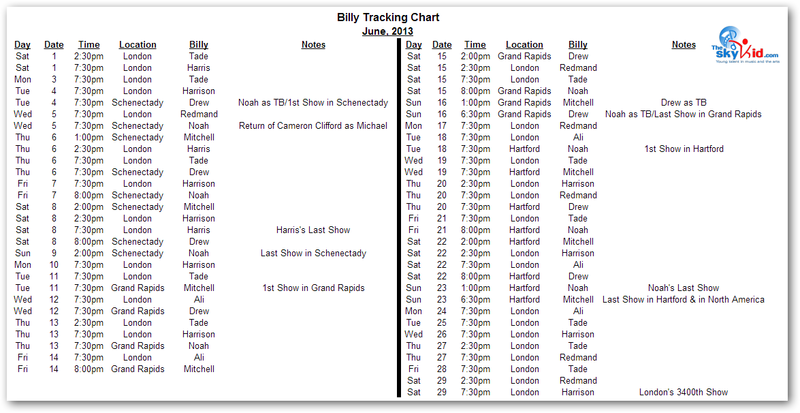 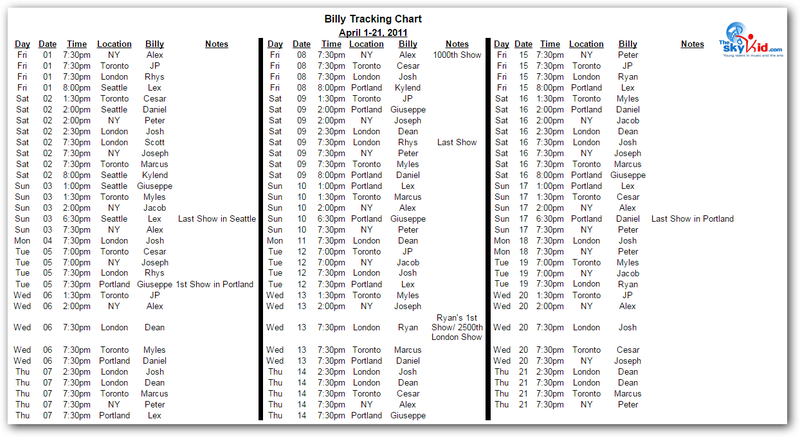 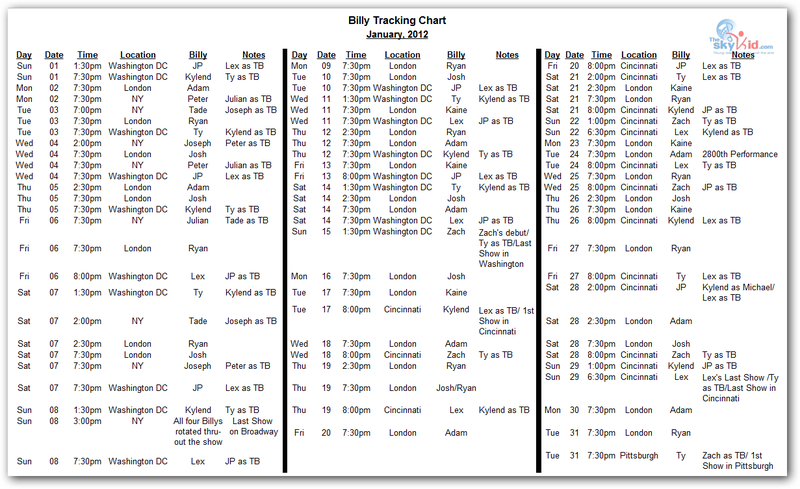 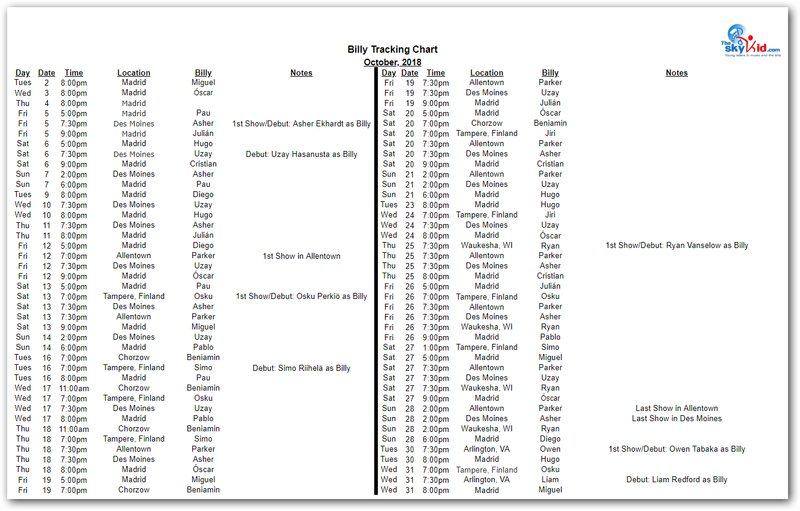 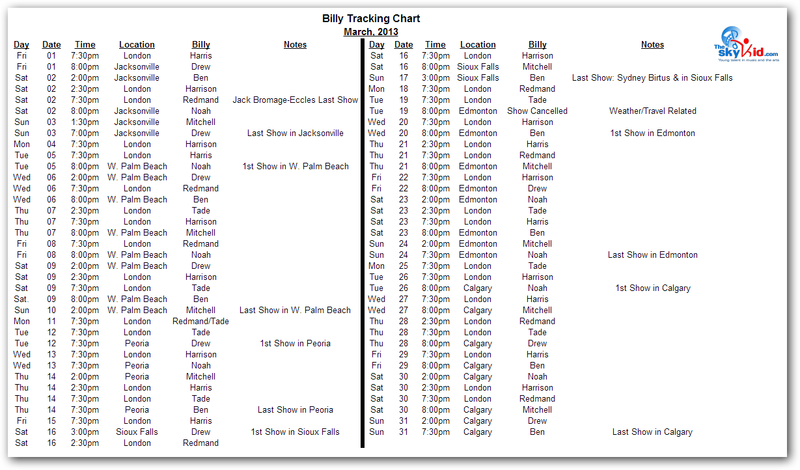 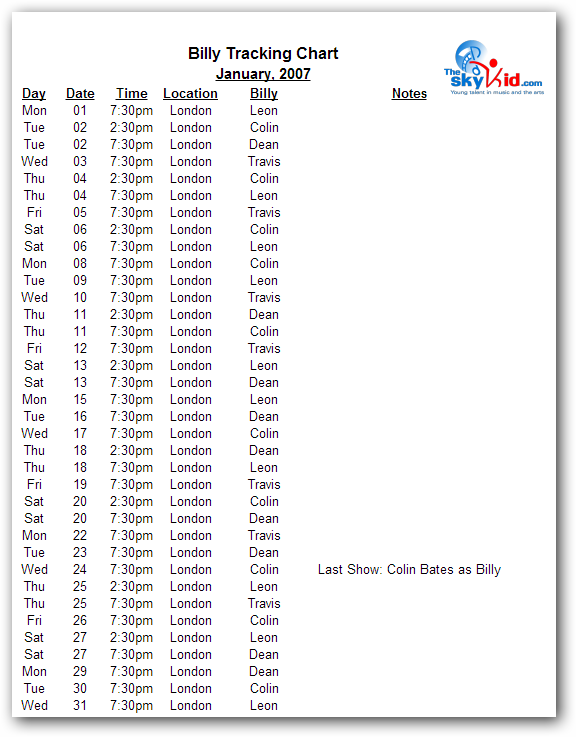 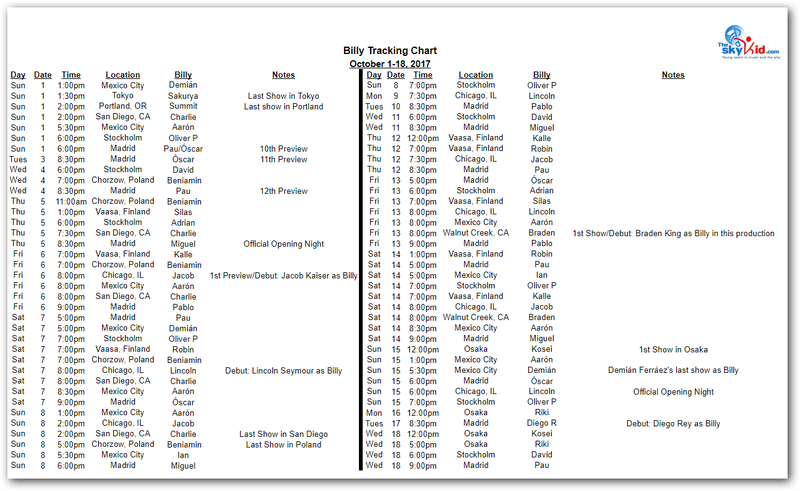 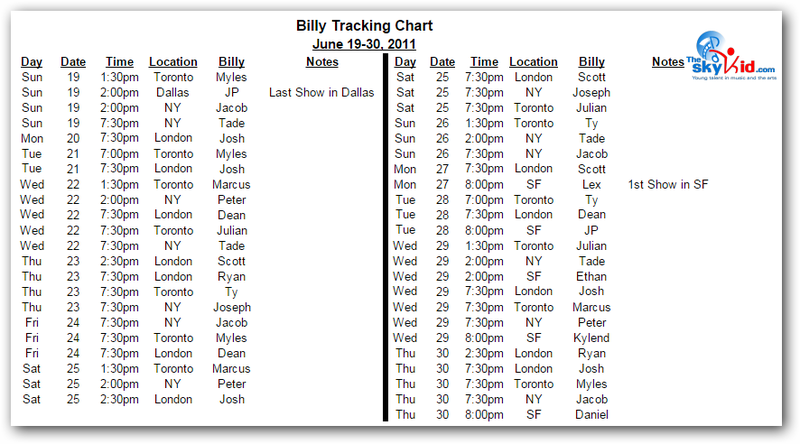 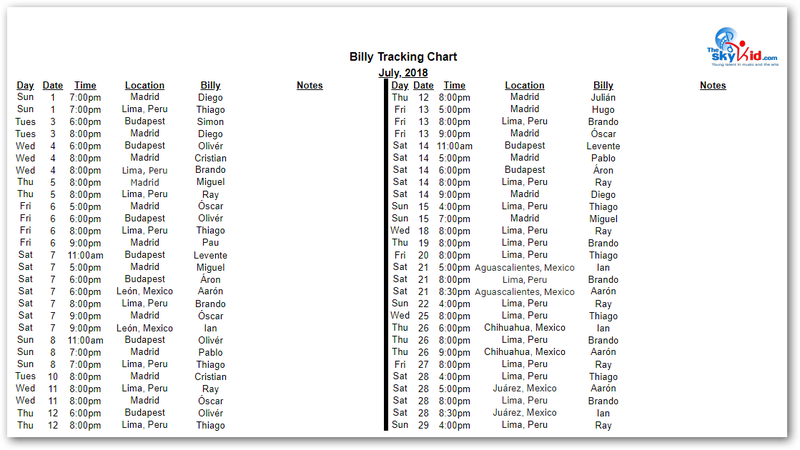 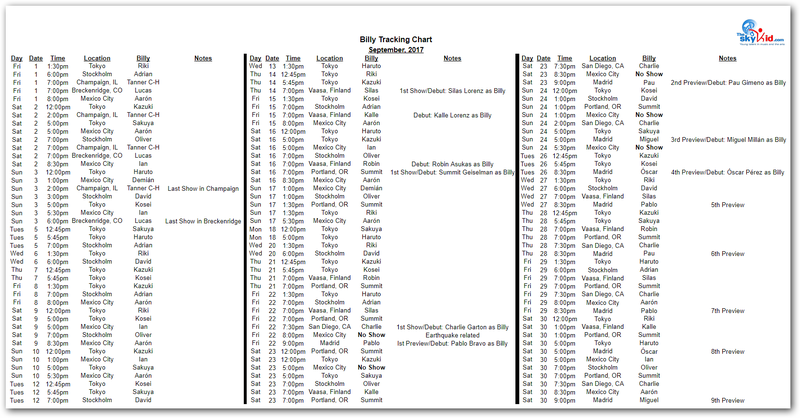 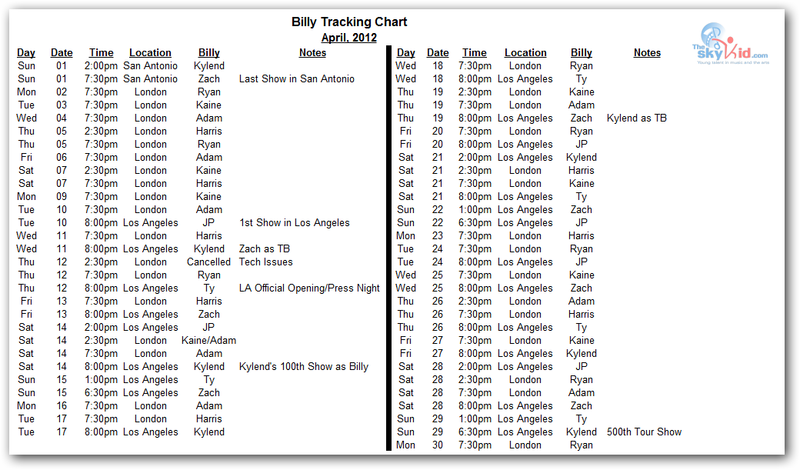 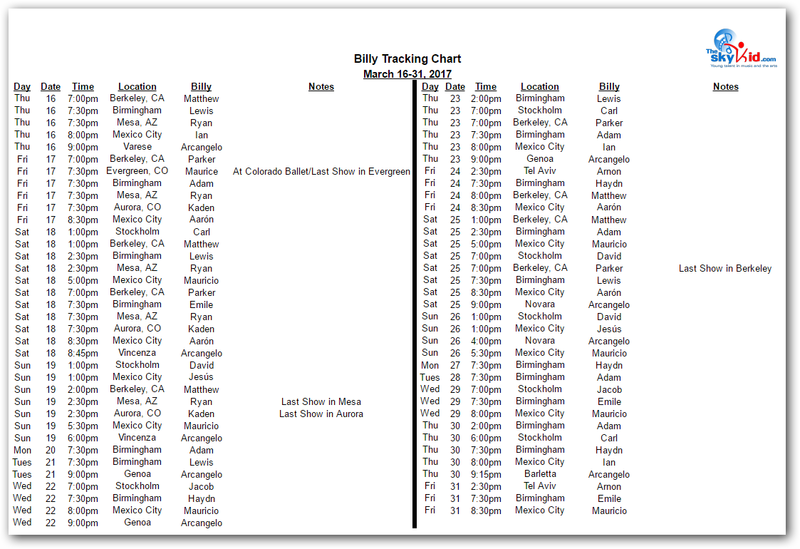 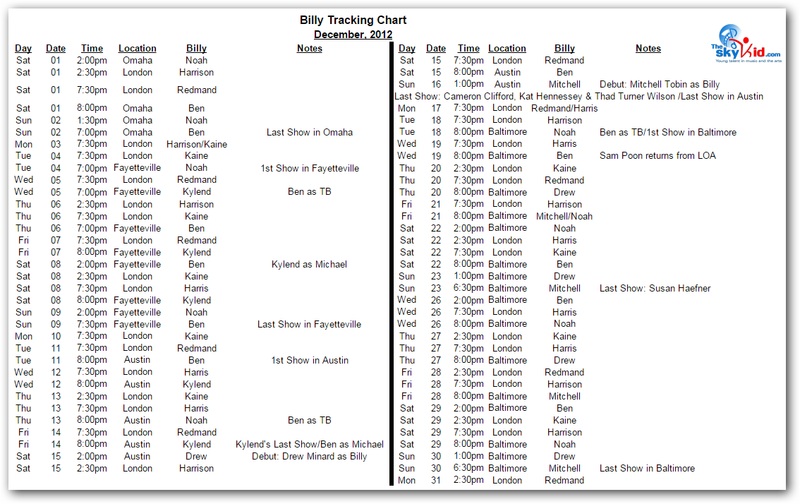 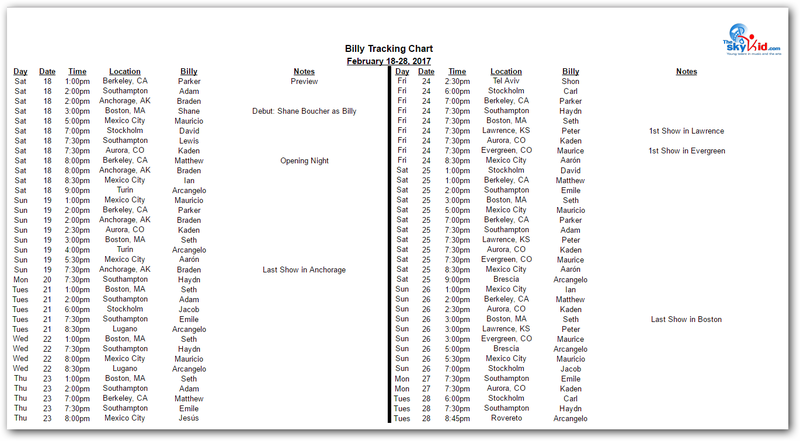 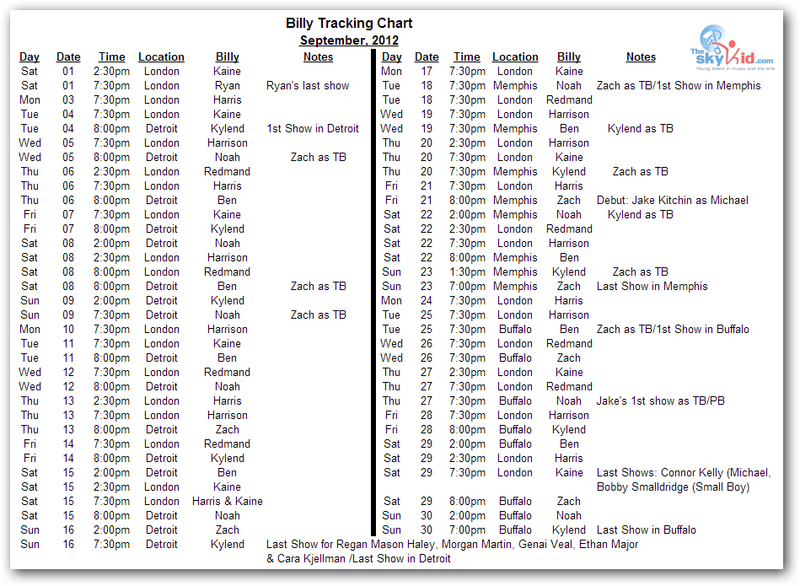 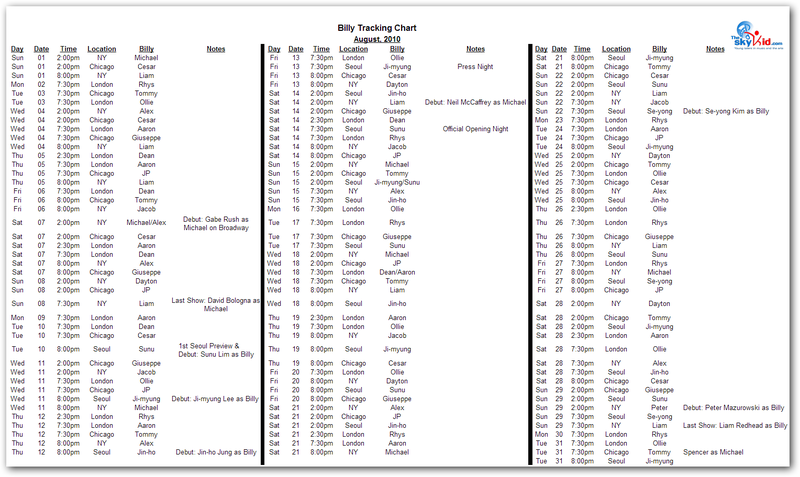 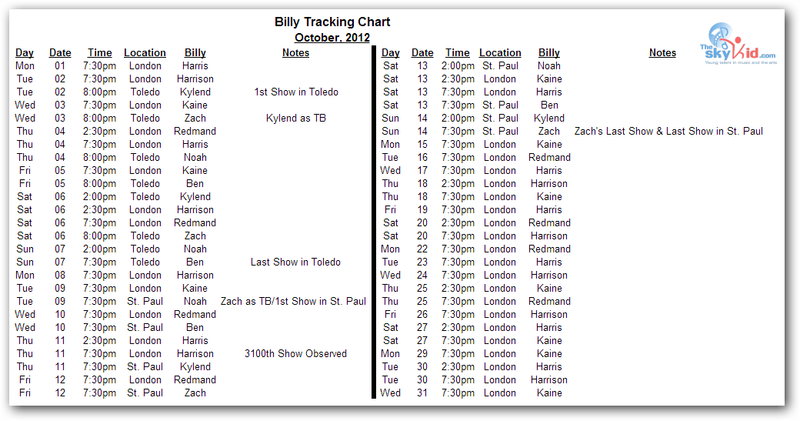 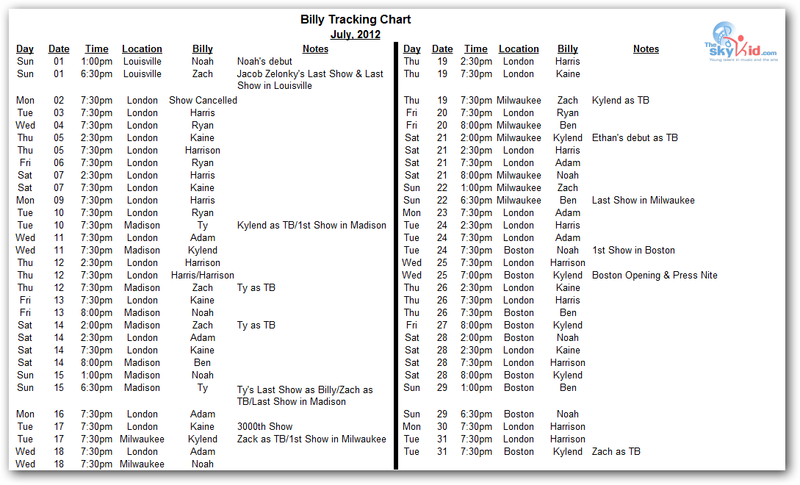 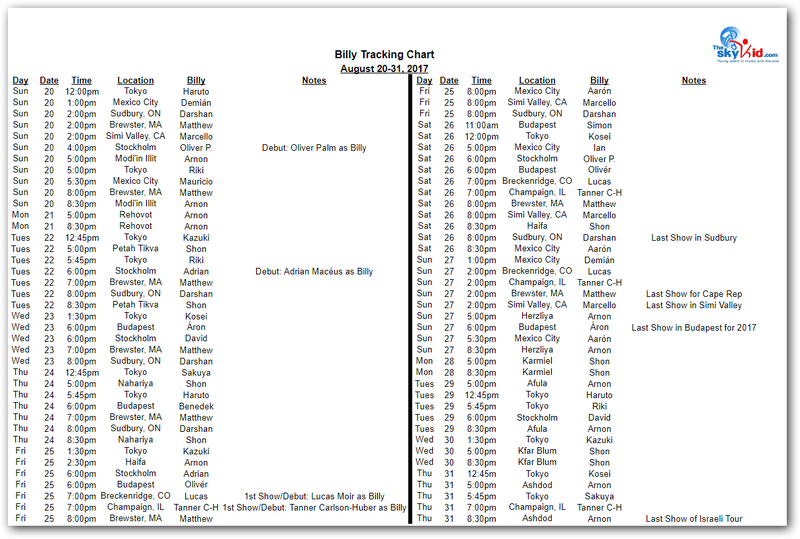 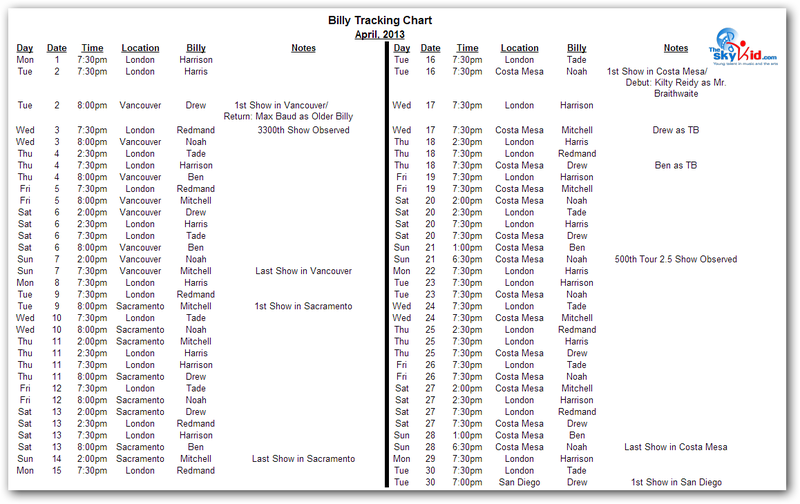 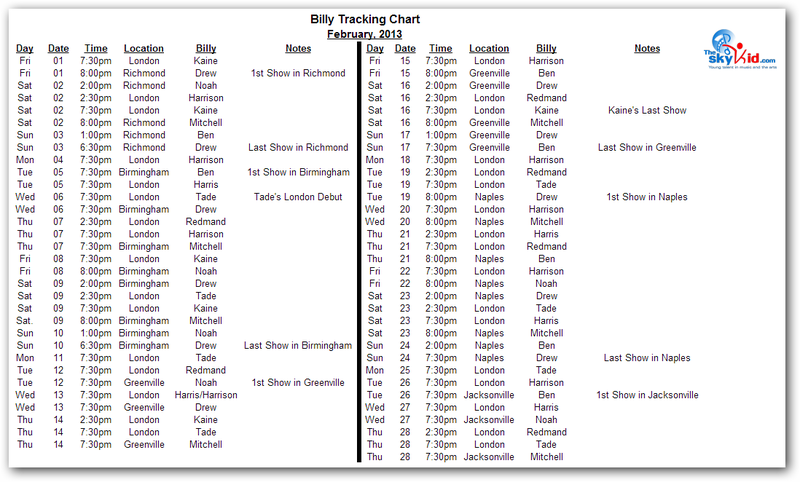 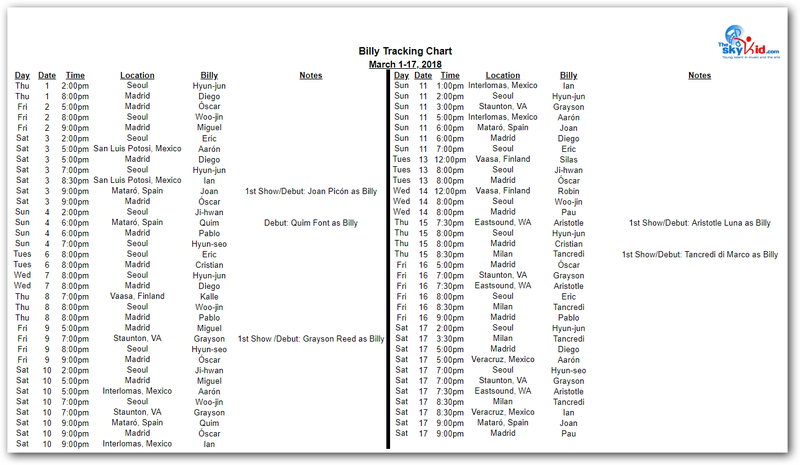 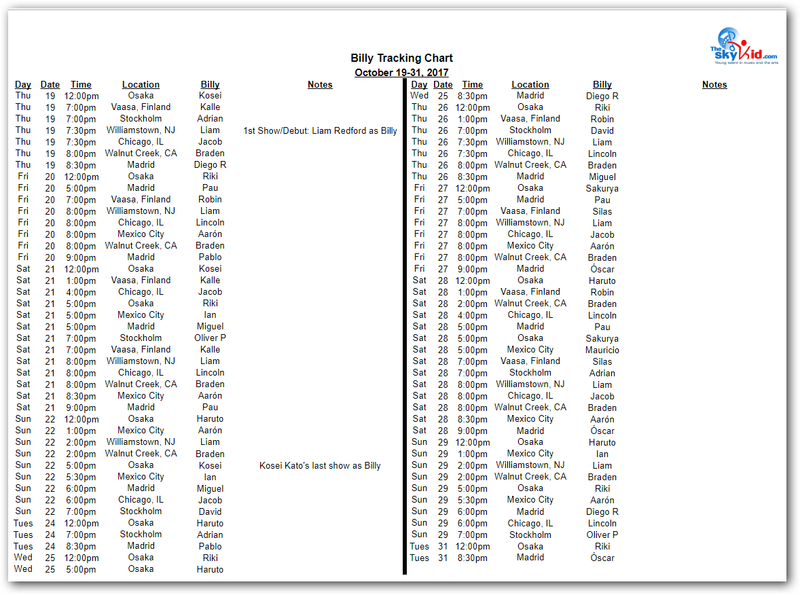 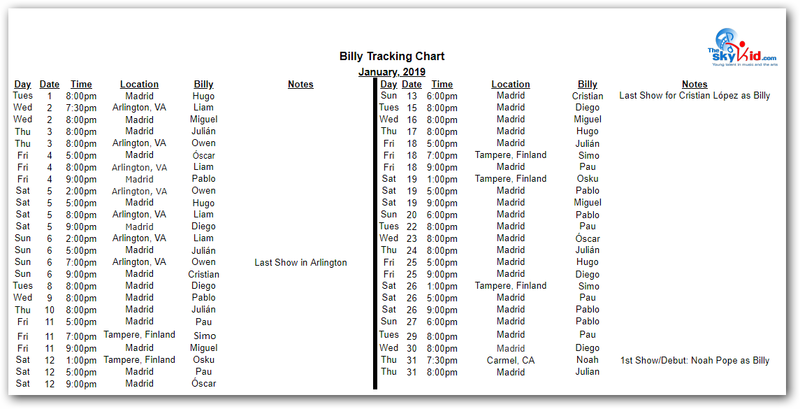 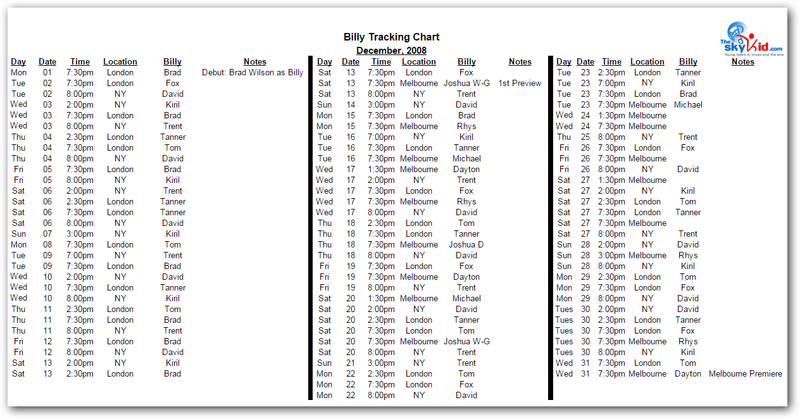 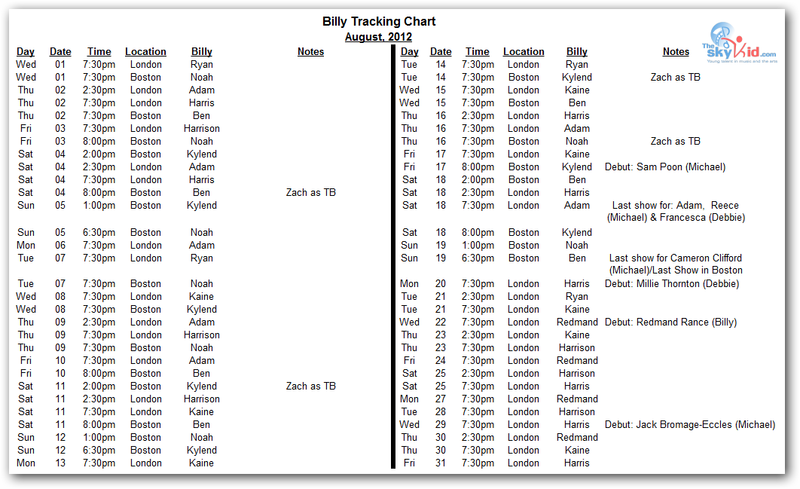 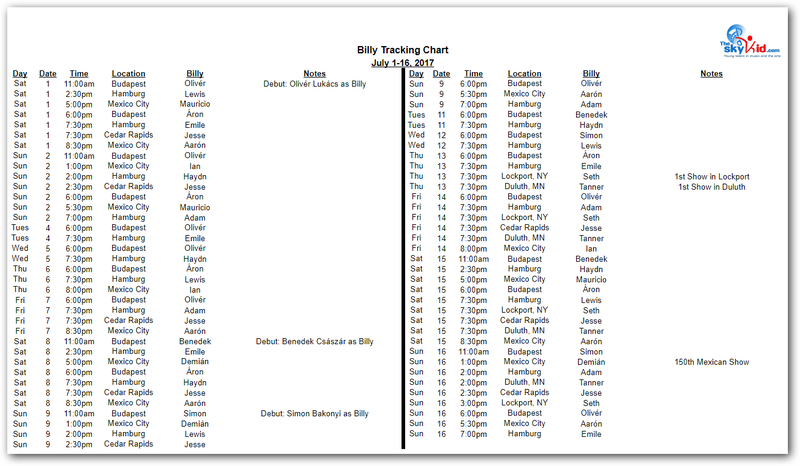 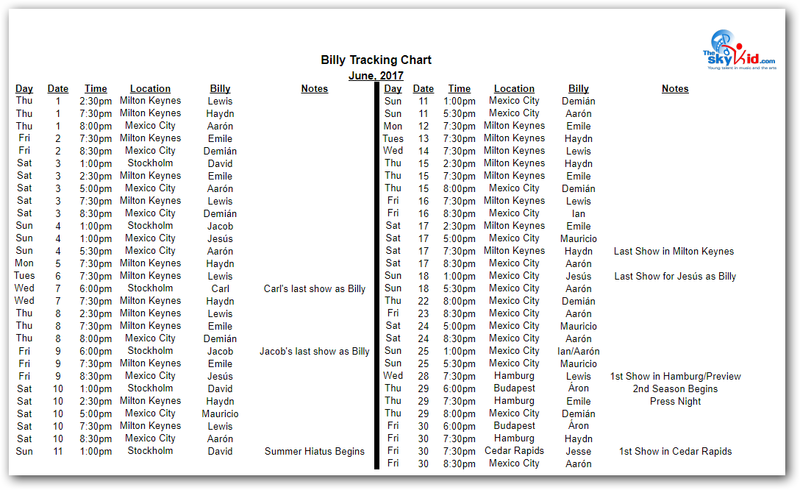 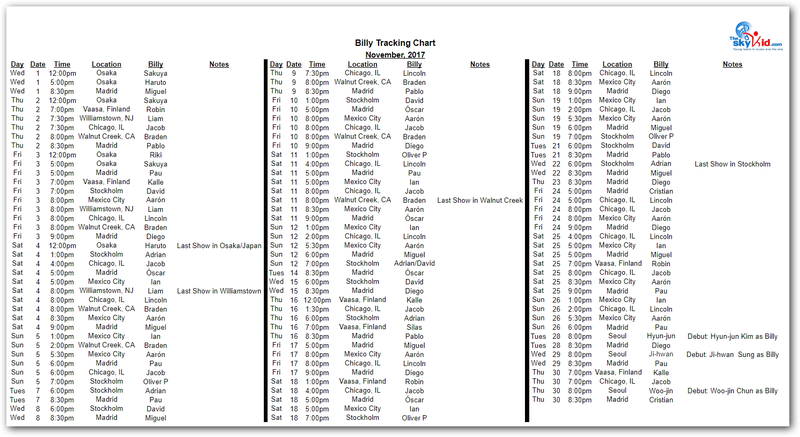 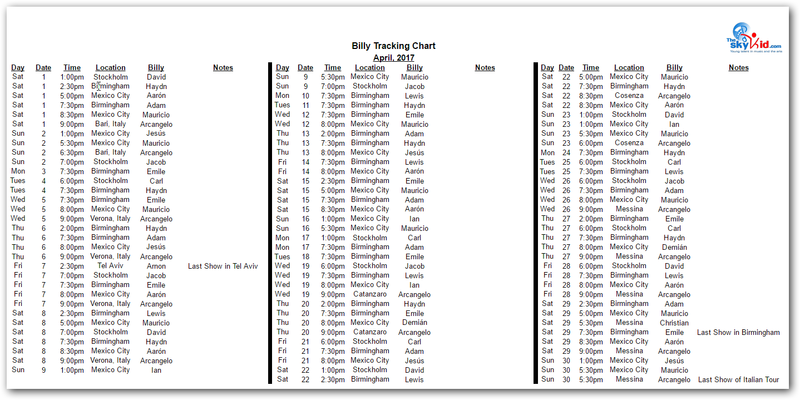 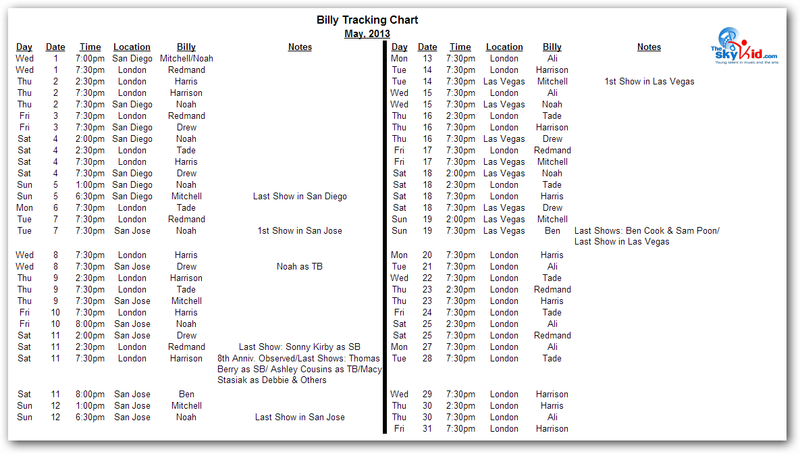 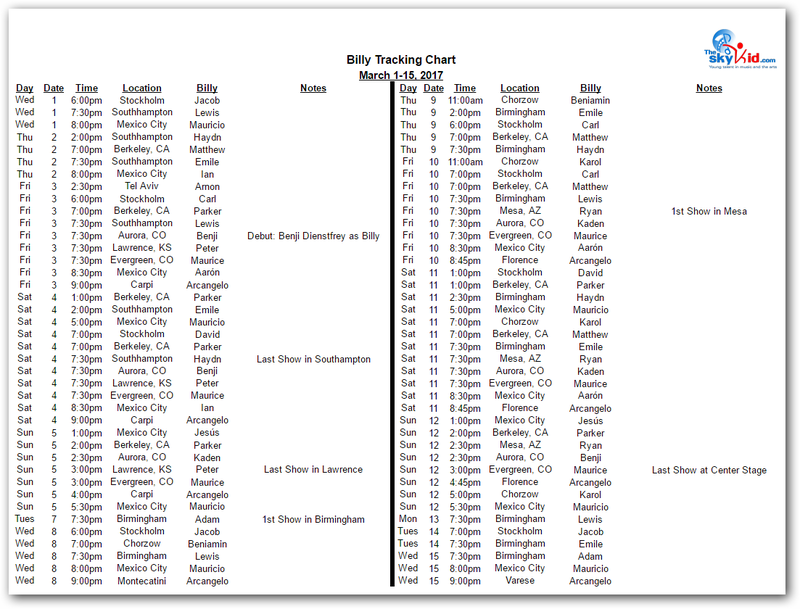 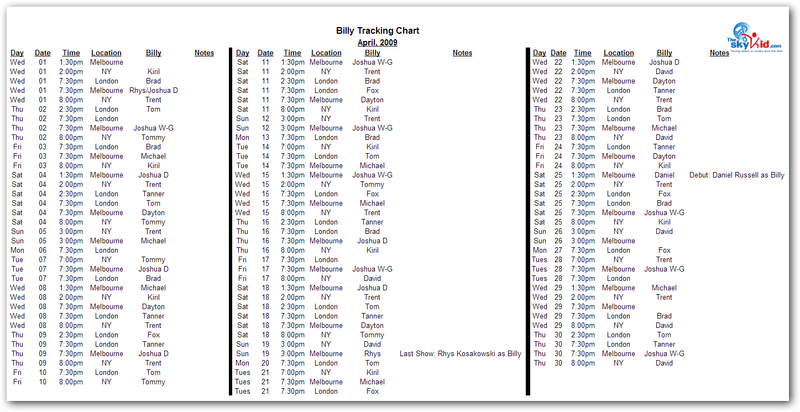 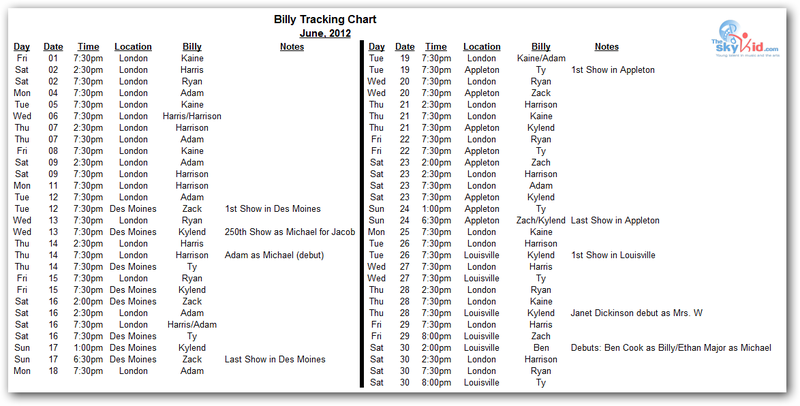 Please note that where charts are split into years, a past Billy’s information appears in the year of his last show.